If you want to go to the very first post on the Atlas of Ice and Fire, click here. How big is the world anyway? The Size and Extent of Westeros and The Size and Extent of Essos, Sothoryos and Ulthos. A Political Map of the Known World. Terra Incognita: Beyond the Known World. The Population of the Seven Kingdoms and The Population of the Free Cities. Unreliable Timelines and Confused Dates. Wonders Made by Man and The Seven Natural Wonders of the Known World. Historical Map 1: The Dawn of Days and other Historical Maps. Geographic Map 1: The Known World and other Geographic Maps. Malazan Book of the Fallen Atlas. One of the most celebrated feats in SF worldbuilding is Helliconia. The creation of Brian W. Aldiss, helped by numerous experts from Oxford University in the late 1970s and early 1980s, Helliconia is the star of the Helliconia Trilogy: Helliconia Spring (1982), Helliconia Summer (1983) and Helliconia Winter (1985). 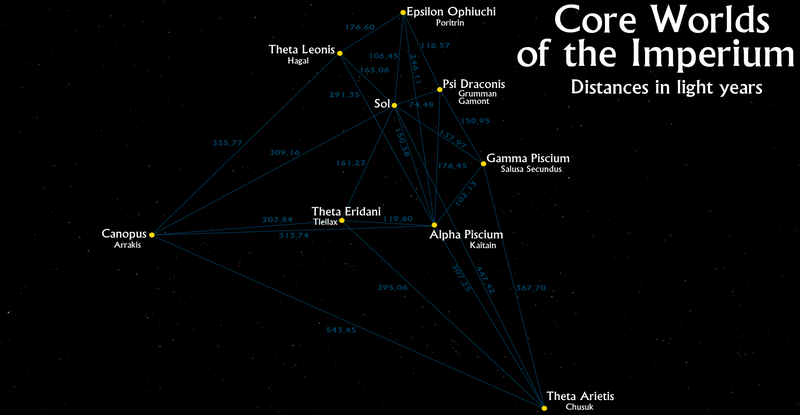 A map of the Helliconia star system. Please click for a larger version. Helliconia is located in the Freyr system. The Freyr system is located approximately 1,000 light-years from Sol, in the direction of the constellation of Ophiuchus. Freyr is not visible from Earth, due to intervening dust clouds located about 700 light-years from Earth and 300 from Freyr. The system contains two stars: Freyr, a blue supergiant, and Batalix, an orange dwarf slightly smaller and cooler than Sol. Freyr is between 10 and 11 million years old; Batalix is more than 5 billion years old. Batalix was caught by the larger star’s gravity during a close encounter approximately 8 million years ago and has been in an elliptical orbit around Freyr ever since. The system also contains four planets, all in orbit around Batalix. Batalix is a G4 orange dwarf with a radius 0.94 that of Sol and a luminosity approximately 0.8 that of Sol. Freyr is an A-class blue supergiant with a radius of 65 Sols and a luminosity 60,000 times that of Sol. Batalix orbits Freyr once every 2,592 Earth years. One of these orbits is known as a “Great Year”. Batalix’s orbit is highly elliptical, ranging from 710 AU at apastron to 236 AU at periastron. Batalix is circled by four planets, including Helliconia and Aganip, which is the innermost planet closest to Helliconia. Helliconia takes 480 local days (which are 13.6% longer than Earth’s) to orbit Batalix once, at a distance of approximately 0.9 AU. This is the so-called “small year”, with small seasonal variations. However, it is the “Great Year” which has a far greater impact on the planet. 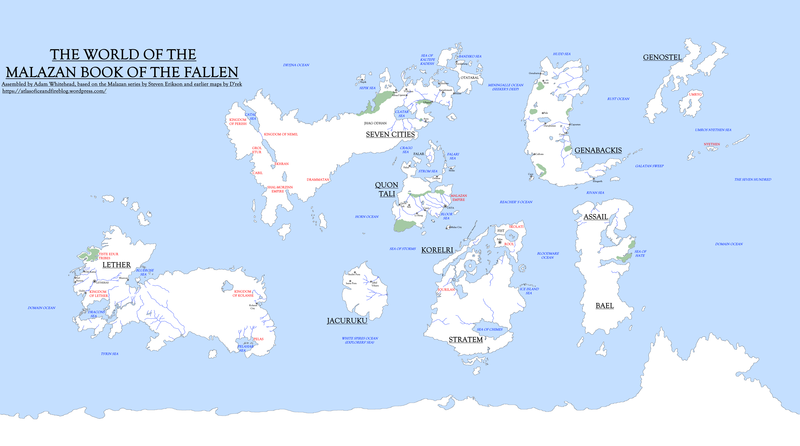 A map of the world of Helliconia. Please click for a larger version. Helliconia formed in orbit around the star Batalix and spent almost all of its existence as a relatively cool world circling a cool star. Helliconia’s pronounced axial tilt (35°, compared to Earth’s 23.5°) makes the world even colder, with large ice caps at the poles. These conditions resulted in the evolution of a species equipped to deal with permanent cold weather: the ancipitals (colloquially, “phagors”). A biped species covered in thick fur, the ancipitals developed rudimentary language and a hunter-gatherer lifestyle by the time of the event known as the Catastrophe. Approximately eight million years ago, Batalix’s galactic orbit took it too close to the supergiant star Freyr and it was captured by the larger, younger star. During this event, Helliconia lost its moon (T’Senh-Hrr in the ancipital language) and at least one other planet in the Batalix system (possibly a gas giant which had helped clear the inner system of comets and asteroids) was ejected. Freyr also lost a binary star companion in the encounter. Once the encounter was complete Batalix was locked into its current orbit. The ancipitals found their existence varying from their preferred freezing conditions at apastron to unbearably hot conditions at periastron. However, other species on the planet found the new arrangements more pleasing. One race of hominids, formerly trapped in the narrow equatorial band which remained ice-free all year round, was able to spread itself across the planet and thrived in the Great Summers, only to retreat during the Great Winters. Over the next eight million years, this species evolved into a race almost completely indistinguishable from humans. The Freyr system was first detected by Earth in the year 3145 AD, when a joint US-Chinese fleet entered the intervening dust cloud region and saw Freyr for the first time, 300 light-years beyond. They detected the presence of Batalix and possible planets in orbit, which was unusual given Freyr’s young age. One planet, located in Batalix’s life zone, was highly promising and given the designation G4PBX/4582-4-3. They dispatched a robotic exploration craft to the system, equipped with self-replicating systems and over 500 human zygotes in storage. This craft entered the Freyr system in 3600 AD and landed on Aganip, the next planet from Helliconia towards Batalix. This craft then constructed a space habitat, the Avernus, and populated it with 512 humans birthed from artificial wombs. The crew of the Avernus was directed to study Helliconia from an orbit 1,500 miles above the planet and beam relevant information back to Earth, even though it would take a millennia to arrive. A view of the north pole of Helliconia. Please click for a larger version. At 1.28 Earth masses, Helliconia is somewhat larger than Earth. The planet possesses three continents: the northern polar landmass of Sibornal, the southern polar landmass of Hespagorat and the tropical central continent of Campannlat. Campannlat is joined to Sibornal via the isthmus of Chalce; it was also once joined the Hespagorat via the Straits of Cadmer, but the land-bridge in that region collapsed some aeons ago. The planet’s northern icecap is enormous, extending south to the northern tropic. Sibornal is mostly uninhabitable due to the icecap, aside from several coastal regions where favourable local geography allows warmer regions to flourish. The Helliconian nations of Carcampan, Bribahr, Shivenink, Loraj, Uskutoshk, Upper Hazziz and Kuj-Juvec lie on Sibornal. The massive Shivenink Mountains are the most notable geographical feature of the northern continent. Campannlat is the most populous continent of Helliconia. Its nations include the mighty theocratic power of Pannoval, trade-focused Oldorando and coastal Borlien. Other powers include Kace, Randonan, Ponipot, Vallgos, Brasterl and Findowel. Major geographic features include the central Quzint Mountains, the Western Barrier peaks, the Madura Desert (the largest desert on the planet) and the tongue-twisting landmass of Nyktryhk: a colossal region of shield volcanoes, mountains and plateaus rising 49,200 feet. This region is uninhabitable by humans, who mostly avoid the high places where free ancipitals still dwell. During the winters, the ancipitals descend from Nyktryhk in great numbers and try to reassert control of Helliconia from their humanoid rivals, with mixed results. The southern polar continent is Hespagorat, although it is less dominated by ice than Sibornal. Nations of Hespagorat include Pegovin, Hespateh, Throssa, Iskahandt and Dimariam. There are huge mountain ranges in Pegovin and Throssa, but otherwise little of geographic interest in this region. The planet’s largest ocean is the Climent, which lies west of Campannlat. Marginal seas of this ocean include the Pannoval Sea, Kowass Sea and Sibornal Sea. East of Campannlat lies the Ardent Sea, which meets the Climent Ocean north of Pegovin. Marginal seas of the Ardent include the Gulf of Chace and Scimitar Sea. The Sea of Eagles and Narmosset Sea divide Campannlat from Hespagorat; the Cadmer Straits link the Climent Ocean to the Narmosset Sea. Please follow this link for a globe view of Helliconia. A view of the south pole of Helliconia. Please click for a larger version. The seasons on Helliconia last for centuries, as Batalix takes 2,592 (Earth) years to complete one revolution around Freyr. At the time of closest approach, Freyr becomes 30% brighter than Batalix in the sky and bombards the planet with greater heat, until the equatorial band becomes uncomfortably hot. At the time of greatest separation, Freyr becomes merely the brightest star in the sky and the icecaps advance south and north into the central continental region. During summers, the Helliconian humanoids are the dominant species on the planet, but during the winters the ancipitals or phagors become dominant once again. One question that invariably arises when new maps of the Malazan world appear is how the climate works, since it clearly isn’t like our world. Deserts are present at unlikely latitudes and vast ice fields at even more unlikely latitudes. A map of the Malazan world with deserts and forest areas highlighted. Please click for a larger version. In the deep prehistory of the Malazan world, a mighty war was fought between a race of proto-humans known as the Imass and an Elder race known as the Jaghut. The Jaghut were masters of ice and cold magic, drawn from the Elder Warren of Omtose Phellack. During the war, which lasted hundreds of thousands of years, the Jaghut repeatedly created vast ice fields to throw the Imass off their hunt, creating huge icy redoubts where they could survive for millennia. However, the Imass chose to simply wait them out, undergoing the Ritual of Tellann to become the undead warriors known as the T’lan Imass. Eventually most of the Jaghut were killed and the Imass disappeared, either destroyed or becoming dormant until summoned back to life by the rediscovery of the First Throne. But the immense ice fields left behind by the Jaghut remained, and these fields seem to have contributed to the strange climate of the Malazan world. The largest ice fields are located in equatorial regions, on either side of the island-continent of Jacuruku, making travel to that landmass difficult and dangerous, and also sprawling across the north-western end of the Letherii continent. This last ice field is the most powerful, created by the Jaghut arch-sorcerer Gothos in the aftermath of a magical conflagration between the Tiste Edur and Tiste Andii, and seems to have had dramatic side-effects across the entire continent, disrupting at least the perception of time (so the records of the Kingdom of Lether show that 7,000 years have passed since the continent’s colonisation, rather than over 70,000 years) and freezing in place the use of the Holds as the primary form of human sorcery rather than the Paths (the younger Warrens). A significant ice field is also located on Quon Tali, separating the main body of the continental landmass from the subcontinent of Falar to the north. A further field sprawls across the southern frontier of Korelri, just north of the Aurgatt Range, separating the subcontinents of Korelri and Stratem from one another. Further ice fields are located south of Seven Cities and west of Quon Tali (discouraging explorations of south-western Seven Cities from Quon Tali, which is probably a good thing due to the presence of the fiercely isolationist Shal-Morzinn Empire). These are, of course, only the major ice fields left behind by the Jaghut. Much smaller ice fields, often indistinguishable from mundane glaciers, are located right across the globe, from Assail to northern Genabackis. The ice fields are one part of the equation. The other oddity is the presence of large deserts – the Bandiko and Otataral – at a very northern latitude on Otataral Island, and the presence of numerous areas of scrubland, border-desert and wastelands, collectively known as odhans, sprawling across eastern Seven Cities, also much further north than you’d expect (especially given Seven Cities’ numerous inland seas, lakes and lengthy rivers). The answer seems to lie in a number of mysterious, gigantic statues built of an unknown jade-coloured material. These Jade Statues arrived on Otataral Island tens of thousands of years ago and seem to have turned the island dead, destroying the natural wildlife and creating the magic-deadening ore also called otataral. The disruptions to the climate seem to have spread across neighbouring Seven Cities, which in the days of the First Empire seemed to be much greener and more verdant, the home to vast, sprawling cities and a tranquil inland sea. After the climate disruptions the land became blasted and sere, and the inland sea dried up to become Raraku, the so-called Holy Desert. The Malazan world is thus still afflicted by the ruins of conflicts that raged three hundred thousand and more years ago. To the people of the world, these oddities are the norm and not worthy of much investigation. The question does arise, however, should the Jaghut rituals fail and the ice start melting, what will happen to the low-lying areas of the planet? One of the most constant projects I’ve been working on for the past decade is the refining and improvement of a world map for Steven Erikson and Ian Esslemont’s Malazan series of epic fantasy novels. This led to the Malazan Maps of the Fallen series I ran in early 2018. 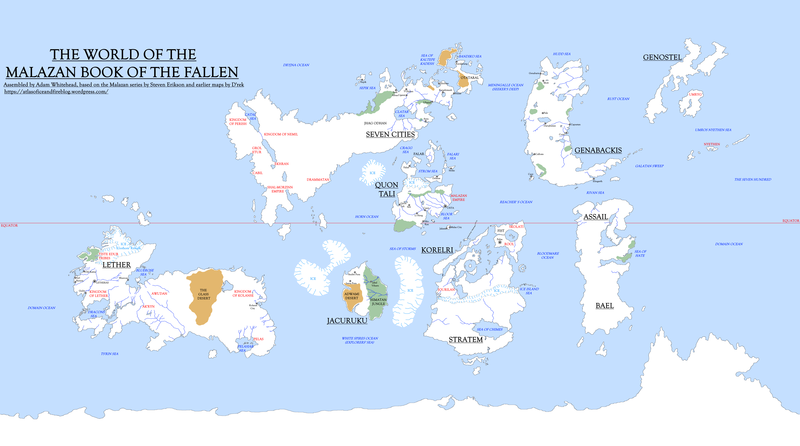 The new, improved Malazan world map. Please click for a larger version. 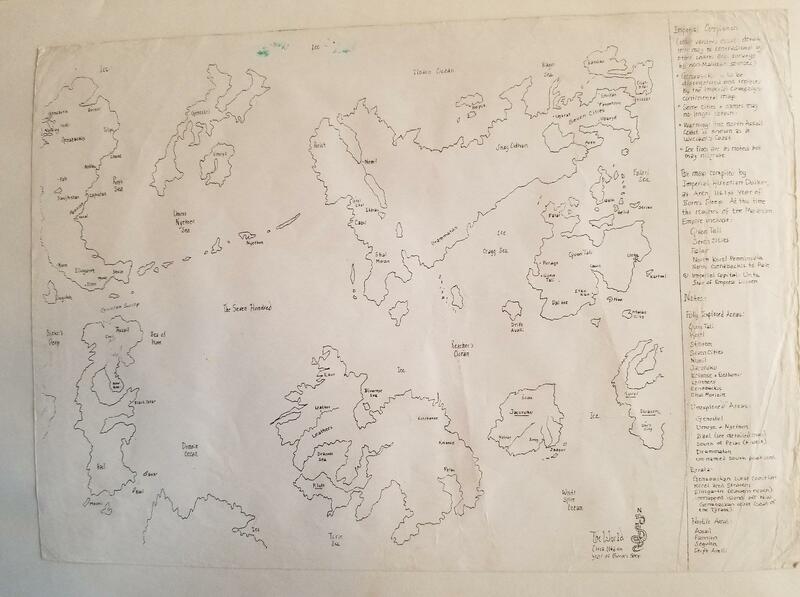 I wasn’t expecting to revisit the Malazan setting so soon, but a few months ago Steven Erikson released his original Malazan world map from the 1980s on his Facebook page. Although many of the details of the map have changed since Erikson created the original (as seen in the maps in the books), the general shape of the world and landmasses remains the same. 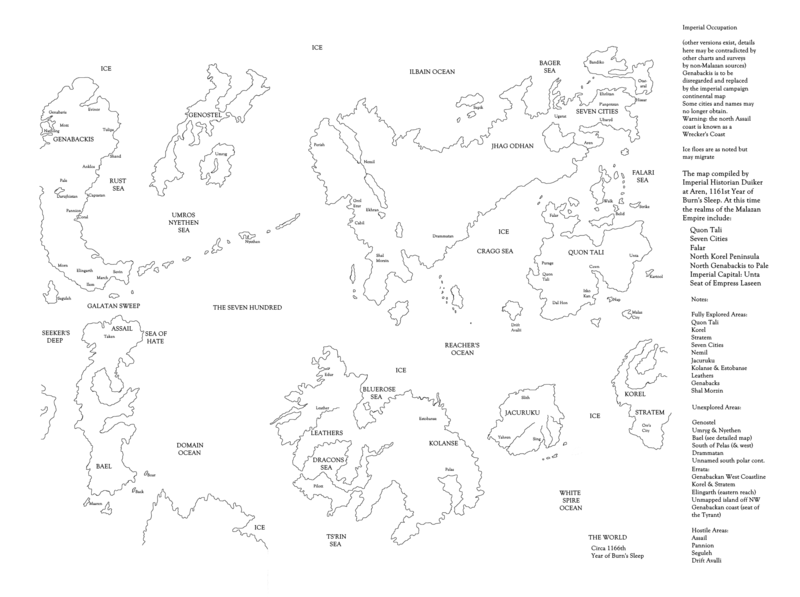 As such as, I was able to revisit the prior world map (created by D’Rek on the Malazanempire forum, although I moved and resized some of the landmasses and added new labels) and revise it. I also took this opportunity to redraw the entire map, as the previous one was not at high enough a level of resolution to mark in all the details required. I made a fresh copy of this map for clarity. Again, it should be emphasised that Erikson drew this map in the 1980s, a clear decade and more before he published Gardens of the Moon, and it represents the world of Malaz at an earlier stage in its conception, hence “Leathers” instead of “Lether” and so forth. A cleaned-up and clarified version of Erikson’s original map. I then combined this map with the prior world map. Several judgement calls had to be made here, most notably because Erikson was using a rough, square base for his world map whilst I have been using a rectangle meant to reflect the dimensions of a spherical world. This mean some re-placement of landmasses to make more sense in a more realistic context. Korelri/Stratem I left unchanged from the previous map. Erikson himself notes that the original conception of Korelri/Stratem had changed anyway (presumably as he’d passed it over to Esslemont to develop further) so it was in error on his original map. This means that we still don’t have a canonical map for Stratem (which remains the biggest anomaly in Malazan cartography), but a whole host of other problems were resolved, including canonical information on the shape of Bael, the western extent of Seven Cities and the location of Genostel and Umryg. Some additional finessing was required: Lether is clearly larger and more stretched on an east-west axis in the book than on the original map, so I mostly retained the prior world map appearance. I did adjust the entire east coast of Lether (in the area of Estonbase and Kolanse) because the original was clearly incorrect. I also increased the size of Jacuruku. It is possible that Korelri/Stratem remains too large on the new map and should be taken down in size, but I await further information to see if that is warranted. One of the most interesting bits of new information was the existence of a southern polar continent, with a northwards extension between Assail and Lether. For now, this is the most up-to-date and semi-canonical Malazan world map that exists. I await more information emerging from future books to see if it can be updated any further. The Imperium is the name given to the cluster of worlds inhabited by humanity at the time of the Dune novels. The six novels of the Dune Chronicles cover a period of approximately five thousand years, during which time the definition of the Imperium changes dramatically. These maps show the Imperium as it is at the start of the Dune Chronicles, in the Year of the Guild 10,191, almost 22,000 years into the future. The Imperium can trace its ancestry back to when humans first managed to successfully leave their homeworld and start exploring the Sol system. This took place approximately 11,000 years (one hundred and ten centuries) before the founding of the Spacing Guild (BG, Before Guild). Humanity initially left their home system in slower-than-light sleeper ships, and later developed a primitive FTL system that allowed them to traverse the stars in a reasonable timeframe, but still achingly slow. It was during this period that the stars within 50 light-years or so of Old Earth were explored and settled. Giedi Prime, Ecaz, Caladan, Harmonthep, Richese, Ix and Atar were likely colonised in this initial period of exploration and settlement. Exploration beyond this initial cluster of worlds was difficult and slow, due to the crippling low speed of FTL travel. Scientists bent all their efforts to discovering ways of travelling faster, or of even “folding space” through artificial wormholes to travel instantaneously from one point in the universe to another. The latter was theoretically doable, but science alone could not find a way of achieving this. Despite the slow pace of colonisation and expansion, it nevertheless continued until thousands of worlds had been settled. By 2000 BG the Landsraad League had been founded, an alliance of the thousands of worlds useful for trade and diplomacy. Over the next two thousand years, a schism appeared in humanity, one that gradually grew more pronounced. Many humans believed in the primacy of human spirituality and the soul (such as the Zensunni sect, founded in 1381 BG), but others had gradually supplanted themselves with technology and the pursuit of artificial intelligence, AI, the “thinking machines” of legend. Gradually the two sides grew further apart and more fearful of the other, until the only result could be war. The Great Revolt, the Butlerian Jihad, erupted in 201 BG and concluded in 108 BG with the epic Battle of the Bridge of Hrethgir (where a general of House Atreides had a Harkonnen banished for cowardice, beginning ten thousand years of enmity). Billions died, entire worlds were put to the flame, but at the end of it the spiritualists and humanists stood triumphant. The machine cults were overthrown and the development of AI was halted everywhere. Only on Ix and Richese was technological development permitted to continue, and this under strict restrictions. In the wake of the victory, the 13,333 worlds then in the Landsraad League agreed to come together to create a new spiritual imperative for mankind, resulting in the writing of the controversial Orange Catholic Bible. What happened in the succeeding century is a matter of conjecture. It is known that the Battle of Corrin, fought in 88 BG near Sigma Draconis, established a new primacy, with the noble House Corrino rising to rule over the entire Landsraad League from Salusa Secundus. It is also known that several of the companies and corporations engaged in interstellar travel suddenly and abruptly discovered a new form of space travel, the much-vaunted method of “folding space” instantly. How this was accomplished was, at the time, unknown, save that it heralded an explosion of exploration and colonisation. 88 years after the Battle of Corrin, the corporations who knew this secret amalgamated into the Spacing Guild. The coalescence of the Guild and the rise of House Corrino and the beginning of the reign of the Padishah Emperors happened near enough simultaneously for them to both be credited with establishing the founding of the Imperium. For ten thousand years, the Imperium swept through the galaxy, colonising thousands upon thousands of worlds. Dozens and then hundreds of Houses Minor arose to join the Landsraad, but the real power remained concentrated in the Major Houses, the old houses which had survived the Great Revolt: Corrino, Atreides, Harkonnen and maybe a few dozen others. Supreme was House Corrino, from where the line of Emperors was derived. Several times, attempts were launched to unseat House Corrino, but all came to nothing. One incident reportedly rendered Salusa Secundus too hostile to comfortably inhabit (the records are vague), but the Imperial Court simply removed itself to another holding, Kaitain, and had Salusa Secundus redesignated as the Imperial Prison Planet. At some point, it became known that the Spacing Guild had achieved its ability to fold space through the use of a drug, melange, a spice. Its origins were unclear, and jealously guarded, until the truth was revealed: the drug was native to Arrakis, a small desert planet circling Canopus. Emperor Shakkad Corrino assigned the Imperial Chemist to investigate the drug in full. Yanshup Ashkoko’s report confirmed the geriatric properties of spice, allowing those who ingested it to extend their lifespan by decades and improve their health during that longer lifespan. The mysterious sisterhood of the Bene Gesserit, who had used various poisons and chemicals to improve their bodies and gain prescient powers, also found that the spice worked far better than any of their normal chemicals, giving them tremendous powers. Thus, humanity entered a new golden age of living longer, travelling further and seeing more than it ever had before…but also faced decadence, a crushing apathy brought about by the oppressive power of the factions of the Imperium: the Emperor, the Landsraad, the Guild and the Bene Gesserit. For thousands of years the wheel turned and humanity went about its business. House Atreides took possession of the verdant garden world Caladan and prospered for twenty-six generations, its riches and fortunes improving until it could even rival that of House Corrino. But elsewhere, there was great oppression. Old Earth became uninhabitable and was abandoned. The Zensunni people were persecuted, forced to flee from world to world. They were enslaved on Poritrin and forced to colonise and work on Bela Tegeuse and Salusa Secundus, and from there to Thurgrod, Rossak and Harmonthep. Harmonthep was destroyed for reasons still unknown, and the Zensunni thence fled to Arrakis. There they disappeared into the desert, becoming the rumoured and rare “Free Men”; the Fremen of Dune. In 10,111 the Emperor ordered the Harkonnens to take possession of Arrakis to mine the spice. The Harkonnen way was brutal, sadistic and cruel. Under their stewardship, spice production first rose but then fell. The Fremen declared the Harkonnens their enemies and scarcely could any Harkonnen soldier leave his barracks alone without being killed. The Landsraad grew unhappy with the situation, and eighty years later, in 10,191 the Emperor, Shaddam IV, was forced to remove the Harkonnens and replace them with the Atreides. This was a dangerous move, for Duke Leto Atreides had become a great leader, a wise humanitarian, canny politician and formidable general, the darling of the Landsraad. Shaddam saw in Duke Leto an enemy that he had to crush. Thus was set in motion a chain of events that would change the fate of the galaxy. 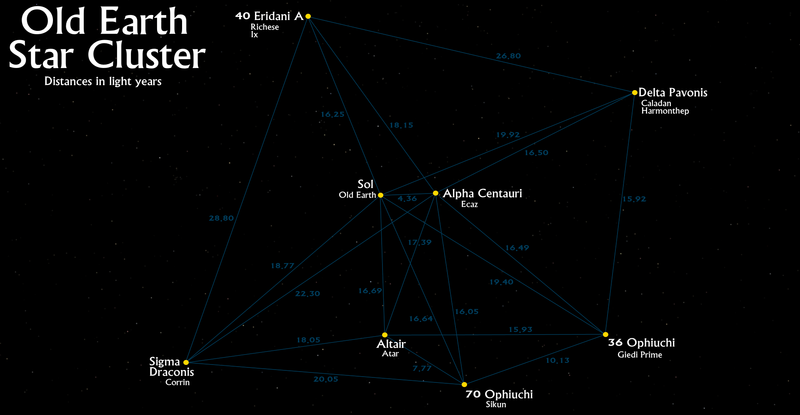 A map of the stars surrounding Old Earth. Please click for a larger version. This map shows the old core of the Imperium. Sol, location of Old Earth, is shown near the centre, although the abandonment of Old Earth has rendered it more or less irrelevant to modern galactic affairs. The Spacing Guild’s ability to fold space and travel from any point in the universe to any other instantly has rendered the physical distances between stars moot (although some believe the difficulty of such jumps increases with range; the Guild Navigators are silent on this), but this map reflects the pre-Guild expansion of humanity through near space, using ancient sleeper ships and then a more primitive form of FTL travel which still required physical movement through space. Shown are the ancient names for the stars, some of which were later changed. 40 Eridani A, the star of Richese (the fourth planet) and Ix (the ninth), is more colloquially known just as “Eridani A,” for example. A map of the Core Worlds of the Imperium. Please click for a larger version. This map shows many of the more familiar worlds of humanity. They represent something of the extent of known travel using pre-Guild space travel methods (although with almost thirteen and a half thousand settled planets by the time of the Guild’s founding, the majority are not shown on this map). 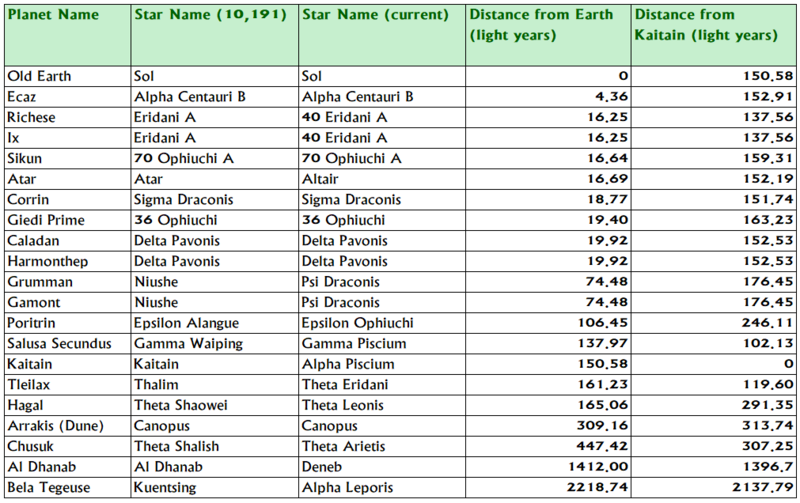 Settled later than the Old Earth Cluster, these stars have moved even further from their original names. Gamma Waiping, the star of storied Salusa Secundus, is a corruption of Gamma Wae Ping, itself a fusion of Greek and Chinese nomenclature for the constellation of Pisces. Thus Gamma Waiping would be known to the ancients as Gamma Piscium. A large-scale view of the Imperium. Please click for a larger version. 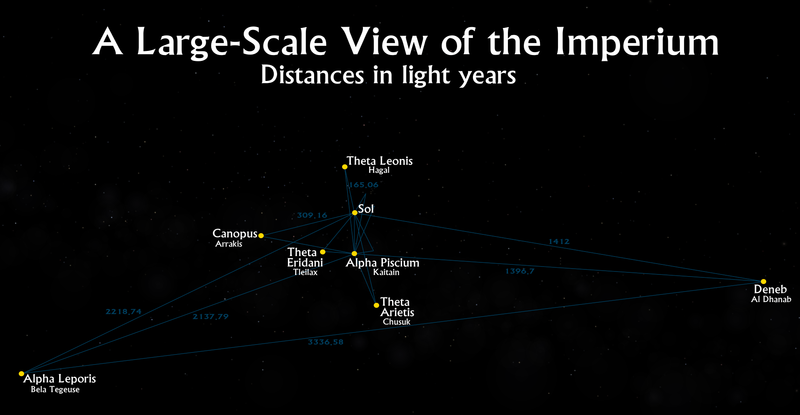 This map shows a large-scale view of the Imperium, including its most far-flung stars (at least during the early years of the Imperium), Alpha Leporis (the star of Bela Tegeuse) and Deneb (Al Dhanab). On this scale the longest axis of the Imperium is 3,336.58 light-years. Many, many thousands of other settled stars and planets exist in this volume as well. During more recent millennia, Spacing Guild Navigators have carried the flag of the Imperium clears across the galaxy, and in some cases to neighbouring satellite galaxies. With absolutely no sign of intelligent life arising elsewhere in the universe, the limits of human expansion appear boundless. These maps show stars and planets directly mentioned by Frank Herbert in the six canonical volumes of the Dune Chronicles: Dune (1965), Dune Messiah (1969), Children of Dune (1976), God-Emperor of Dune (1981), Heretics of Dune (1984) and Chapterhouse: Dune (1986). Neither The Dune Encyclopedia by Willis E. McNelly nor the authorised tie-in work by Kevin J. Anderson and Brian Herbert (both of dubious canonicity) have been used in the preparation of these maps. The Stars and Planets of Frank Herbert’s Dune: A Gazetteer (1999) by Joseph M. Daniels proved a supreme reference whilst researching these maps. However, the gazetteer does draw a lot on The Dune Encyclopedia for its information. Given Frank Herbert’s declaration that the Encyclopedia was non-canon (if fun), I had to drop several star locations that relied solely on the Encyclopedia as a primary source. However, his arguments for many other star locations and designations were often highly convincing. All of the stars and planets on this map are drawn from Dune’s appendix. The exception is Atar, a world mentioned in Dune Messiah as being a low-gravity world visited by the Fremen jihad. The name, to me, is a clear corruption of Altair. Given Altair’s proximity to Earth and its brightness, it is a logical candidate for settlement. Joseph Daniels’ Stars and Planets of Dune article makes a persuasive argument for “Eridani A” being actually 40 Eridani A. Ix and Richese being in the same system is an assumption based on the fact that, throughout the Chronicles, it is rare to hear one planet being mentioned without the other and the two worlds seem linked at almost all times, which would be odd without physical proximity. Epsilon Eridani may have been a preferred candidate due to being much better-known and a common star used in science fiction (as the location of the titular space station in Babylon 5, for example), but it is not part of a multi-star system (thus the “A” is meaningless). Recent observations have also shown that the star is in the early stages of planetary formation and doesn’t yet have any planets circling it, which also makes it a less appealing candidate (for the most part I have ignored post-1965 astronomical discoveries since Frank Herbert would of course have been unaware of these). All of the stars and planets on this map are drawn from Dune’s appendix. The naming conventions are argued for strongly by Daniels and I have in most cases agreed, although several conclusions of his were drawn from The Dune Encyclopedia alone and these stars (including Rossak and Wallach IX) have thus been omitted for a lack of hard information. This incorporates the previous map and expands outwards to include Alpha Leporis, the star of Bela Tegeuse. Daniels’ argument for placing Bela Tegeuse’s star (named “Kuentsing” in the appendix) in Lepus is strong and Arneb/Alpha Leporis is one of the more notable choices. However, at the time that Daniels wrote his article, no proper distance measurement to Alpha Leporis had been made. More recent observations have confirmed that Alpha Leporis is more than twice the distance first thought. Some observers have suggested that Bela Tegeuse may be a corruption of “Betelgeuse” and that star might serve as a superior choice for Kuentsing. However, Betelgeuse is on the verge of going supernova (which might have in fact already happened and we have not observed the light of the event yet), and certainly should have taken place by 22,000 years in the future, making it a highly improbable candidate for colonisation (the equivalent of building a house inside the caldera of an active and unstable volcano). All of the stars are mentioned in Dune and its appendix, apart from Al Dhanab, a clear corruption of “Deneb”, which is mentioned in Heretics of Dune as the site of a Bene Gesserit stronghold. The planet Arrakis is the source of the most important resource in the entire galaxy: the spice melange. The spice extends life and expands consciousness, permitting the folding of space by Guild Navigators and grating prescient powers to the Sisterhood of the Bene Gesserit. The spice binds the Imperium together. This makes Arrakis (colloquially “Dune”) the most vital and strategically important planet in the Imperium. 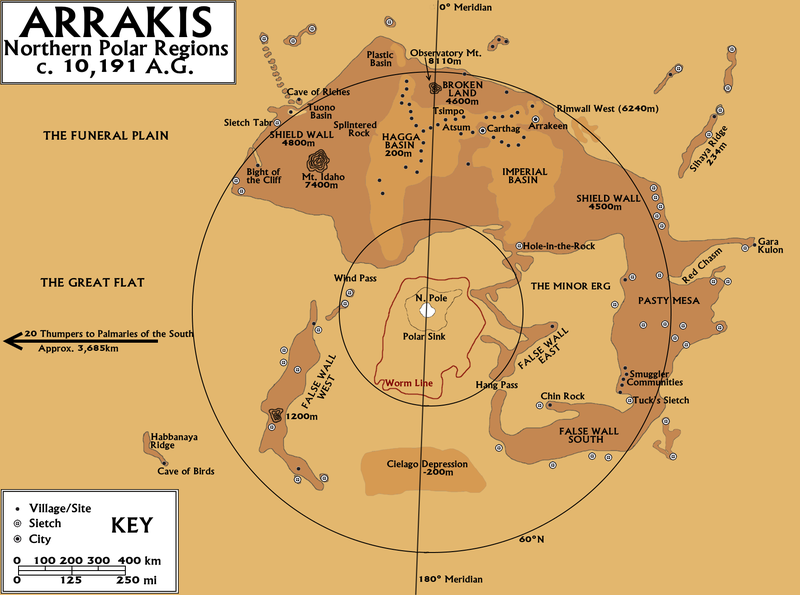 A map of the northern polar region of Arrakis. Please click for a larger version. Arrakis is the third planet of the star Canopus, located 313.74 ly from the Imperial Capital on Kaitain (310 ly from Old Earth). Canopus is an ancient star, a white giant, having already completed its hydrogen burning phase. It is possible to likely that Canopus once had more than the planets currently visible, but the rest were swallowed up by the star’s previous expansion phases and effectively destroyed. Arrakis may have been a satellite of a larger body before being catapulted into its current orbit by the same expansion event. Arrakis is an unusually small planet, matching almost exactly in size the dimensions of Old Earth’s moon, Luna (diameter: 3,474.2 km, circumference: 10,921 km). The planet’s density is considerable, however, meaning that its mass is greater than is normal for a body of its size, giving it a gravitational field only slightly weaker than Galactic Standard at 0.9g. Arrakis is mostly covered in desert terrain similar to the Sahara of Old Earth. The open, flat desert, known as the Great Flat, runs from approx. 60°N to 70°S and consists almost entirely of sand dunes, with very rare rock outcroppings. The sand dunes are about 100m thick, sitting on the bedrock beneath (known as the Great Bled, which forms “sea level” on Arrakis). The Great Flat is scoured by the massive coriolis storms which rage across the open desert. These storms can engulf huge parts of the planet for days or weeks at a time, making any suborbital travel impossible. The planet’s polar regions are considered habitable. A vast rock formation (varying from 4,500m to 4,600m in height, apart from the Rimwall region which rises to 6,240m) known as the “Shield Wall” wraps itself around the northern polar region. The rock itself and the basins in its surface are densely populated with towns and villages, including the only two cities on Arrakis: Carthag (seat of the Harkonnen government for the past eighty years) and Arrakeen (the more traditional, long-term seat of planetary government). The highest point on Arrakis is Observatory Mount, located in the Broken Land of the Shield Wall. Observatory Mount is 8,110m (26,607.61 feet tall). The Prime Meridian of Arrakis (0° longitude) passes through Observatory Mount, as per ancient tradition. The lowest region is the northern polar sink, which drops to 500m below the Bled level. Other regions of interest include the rock formations known as the False Walls, which are located close to the Shield Wall and have been known to confuse travellers; the Sihaya and Habbanaya ridges, the Cielago Depression (200m below Bled level), and the Minor Erg, a small region of open desert locked between the Shield Wall and eastern and southern False Walls. Also of note are the Hagga and Imperial basins, the most heavily-populated parts of the planet. The southern polar region is less well-charted than the northern. There are few corresponding rock regions which are open to habitation. Some believe smugglers may use what rock formations there are in the south to land goods away from imperial sensors before sneaking them in under the orbital trackers. The sand temperature on Arrakis is 345° to 350°K (72-77°C), dropping by 25° above the sand ground level and by 55° underground. Shade reduces the temperature by approximately 18°. Survival on the surface of Arrakis is borderline impossible on the open desert without the use of a stillsuit, a special survival mechanism which reduces body temperature to survivable levels and includes a near-perfect water recycling system. Finding food in the open desert is highly improbable, but there is some extremely isolated tuber growth in cooler crevasses and canyons outside of the direct sunlight. There are also some native lifeforms, such as the kangaroo mouse, desert bat and other animals which are edible if they can be hunted, which is not an easy task. Even for a human well-supplied with food and a well-maintained stillsuit, travelling between the 60°N and 70°S line is ill-advised for the violence of the coriolis storms, vast storm systems which build up across thousands of kilometres of open desert and can cover entire hemispheres for weeks at a time. The Shield Wall and other features of the northern desert help break up the storms in inhabited regions, but on the open desert they are lethal, with winds so fast throwing up sand particles to such velocity they can shed skin from bone. The most famous feature of Arrakis, apart from the spice, is the native lifeform known as the sandworms, also Shai-hulud or “Maker”. Sandworms are immense worm-like creatures with no eyes but keen movement-sensing organs. They travel under the sand, between the surface and the Great Bled, but can be drawn to the surface by rhythmic movements, such as footsteps, explosions, mining equipment or the use of special devices such as “thumpers”. The Holtzmann field generated by shields sends them into a special frenzy, and they will attack any site protected by a Holtzmann field immediately. Sandworms are immense in size; the specimens observed in the northern mining fields range from 50m to 200m in length, but even larger monsters exceeding 400m in length have been seen in the deep desert. Destroying or even injuring a sandworm is regarded as impossible with anything less than field atomics, so instead people are directed to avoid them at all costs. Arrakis as seen from space, art by Christopher Doll. The long-term history of Arrakis is unclear; Canopus is an ancient star which has already undergone its yellow dwarf and red giant stages and is now burning helium in a white giant phase, as well as being an active source of x-rays. It is currently radiating at 10,000 standard solar luminii and is expected to dissipate over the next several tens of millions of years into a planetary nebula, leaving behind a smaller white dwarf (Canopus has insufficient mass to ever go supernova). At present, Canopus is the brightest star in the core of Imperial space. Because of the challenging nature of the Canopus system, Arrakis is extremely fortunate to remain habitable. Theories have ranged from Arrakis being a satellite ejected from further in towards the star before its expansion stages, to it being captured from the so-called “Canopus B”, a star estimated to have made a close pass of the Canopus system several tens of millions of years ago and may now be gravitationally trapped by the core star at a distance of 6.2 light-years. Either way, the planet is fortunate to have found itself in Canopus’s new “life zone” and flourished…relatively. It is known that Arrakis was once much wetter than it is now, with samples taken from the Great Bled (underneath the sand) suggesting that Arrakis’ surface temperature was, for a very long time, in the absolute range of 254-332°K (-19° to 59°C) with a growing season of around 284-302°K (11-29°C), and the desertification of Arrakis is a relatively recent phenomenon, perhaps only on the order of twenty to fifty thousand years. The reasons for the desertification remain unclear, although some ecologists have tied the phenomenon to the presence of the sandworms. It is also unknown when Arrakis was discovered. Eleven thousand years – one hundred and ten centuries – passed between the first fumbling attempts towards the stars by humanity and the chaotic insanity of the Great Revolt (the Butlerian Jihad), the inter-religious war raged between disparate branches of humanity over the use of AI, “thinking machines”. At the end of the war, which lasted ninety-three years, the machine-worshipping cults of humanity had been purged and the old religions of faith and spiritualism (in some cases allied with the always-resilient forces of secularism) had prevailed. These forces came together in the Commission of Ecumenical Translators to create the Orange Catholic Bible, which became the new religious textbook for the spiritual enlightenment of humankind. The work permeated through the 13,333 worlds of the Landsraad League, the body which for two thousand years had united the disparate worlds of humanity in a very loose confederation of trade and diplomacy. Several decades later, the Spacing Guild was founded as we know it, bridging the worlds by folding space, allowing ships to travel from one world to another instantly rather than taking the weeks or months required by standard FTL drive. This was done through the use of the spice melange, which is native only to Arrakis. Thus the discovery of melange must predate the founding of the Guild, 10,191 years ago. As the brightest star in that original cluster of worlds within 500 light-years of Old Earth, Canopus must have been a target for interstellar exploration, but perhaps a low-priority one, for its hostile environment would have made it a poor candidate to harbour inhabitable worlds. Nevertheless, Arrakis was discovered and explored early enough for the melange to be discovered and then exploited by the nascent pre-Guild organisation in the century or so leading up to their official founding. The initial exploration and settling of Arrakis was likely done by hardy explorers and hardy miners, working the wastes to find enough of the spice to satisfy the needs of the Guild Navigators. The Navigators are known to have discovered the ability of the spice to fold space and extend prescience, but how far they let this knowledge develop is unclear; the Bene Gesserit instead used various elixirs and poisons to achieve much the same effects until the more potent properties of melange were discovered; it is also known that the ability of the spice to retard the ageing process in normal humans was not discovered until the reign of Shakkad Corrino, “the Wise”, through the research of the Imperial Chemist, Yanshup Ashkoko. Both of these events may have been some time after the formation of the Guild. As such, the importance of the spice on Arrakis may have been relatively unknown for several millennia. What is known is that the large-scale settlement of Arrakis did not begin until the Zensunni settled there. Religious exiles and wanderers from Old Earth, the Zensunni were forced to make six migrations to other worlds. Their first stop was Poritrin, followed by Salusa Secundus (where tradition holds that they were slaves for nine generations), Bela Tegeuse, Rossak, Thurgrod and Harmonthep, in the Delta Pavonis system. The destruction of Harmonthep (by means unknown, save it had no effect on neighbouring Caladan, already then the primary Atreides stronghold) saw the Zensunni flee en masse to Arrakis. Here, on a small, dry and arid world with a valuable resource but little appetite among the Great Houses for its conquest, they found a ready home. Some of their descendants went into the basins and founded villages and towns, becoming the ancestors of the pyons class, but others went into the deep deserts, to the remote ridges and rock formations and there founded secret strongholds, sietches, and from there they took a new name, the Free Men of Arrakis, or Fremen. Over millennia, the Fremen have become legends, their numbers and strongholds unknown. In 10,111 the rule of Arrakis was given as a fief to House Harkonnen by the Emperor. House Harkonnen’s rule of Arrakis was efficient but brutal, seeing the planet’s workforce worked almost to death in the production of spice. Due to the political manoeuvrings of the Landsraad, the Harkonnens have been stripped of their claim to Arrakis. Instead, their fiercest enemies, the Atreides of Caladan, have been given ownership of the planet on a new contract to mine spice more efficiently. The size of Arrakis is not given in any of the six canonical Dune novels written by Frank Herbert. The Dune Encyclopedia suggests that Arrakis is slightly smaller than Earth, but no evidence is presented to support this and Frank Herbert himself regarded The Dune Encyclopedia as a fun book but effectively non-canon. In lieu of other data, Dune fans in the 1990s seemed to settle on the idea of Arrakis being about the size of Mars, perhaps based on the superficial visual similarity of the two planets. However, it is possible to work out the size of Arrakis from information provided in the original Dune novel by itself. This is because we are given one key distance in the book – the distance between the cities of Carthag and Arrakeen, which is fixed at 200 kilometres – and the provided map gives us longitude and latitude information, most importantly establishing the 60°N line on Arrakis. Using the established scale, we can measure the diameter of the 60°N line (through the north pole) at 1,800 km. We can compare this diameter to the similar dimensions of the same latitude line on Earth, Mars and the Moon, which give us respective figures of 6,693 km, 3,551 km and 1,820 km respectively. Thus we can establish that Arrakis is the same size – perhaps even a tad smaller – than Earth’s moon. Although helpful from some perspectives, such as the speed with which large land armies such as those of the Fremen seem to zip around on Arrakis, this does seem a tad implausible, as small, low-mass planets will have considerably weaker gravity than on Earth and this makes it less likely that the planet will have retained its atmosphere. However, it is possible that Arrakis is rich in dense metals, which in turn have made the planet considerably heavier than is normal for its size and given it a gravitational field of 0.9G, as noted in the novel. The small size of Arrakis is supported by a discussion between Thufir Hawat and Paul Atreides early in the novel, when Thufir says the coriolis storms build up over “six or seven thousand kilometres” of the equatorial circumference band, which is actually smaller than our Moon (where the equatorial circumference extends for just over 10,000 km) but vastly smaller than Mars (20,000 km) or Earth (40,000 km). These maps cover the second part of our heroes’ journey in The Eye of the World (Book 1 of The Wheel of Time). For a detailed summary of The Eye of the World, please follow this link. This part of the narrative atlas covers our heroes’ journey from the ruined city of Shadar Logoth to Caemlyn. Note that the dates are taken from Steven Cooper’s excellent Wheel of Time Chronology. A map of the journeys from Shadar Logoth to Caemlyn. Please click for a larger version. The party from the Two Rivers – Moiraine Damodred, al’Lan Mandragoran, Rand al’Thor, Mat Cauthon, Perrin Aybara, Thom Merrilin and Nynaeve al’Meara, reach the ruined city of Shadar Logoth on the evening of the 11th day after the Trolloc raid on Emond’s Field, three days after leaving Baerlon, and take shelter there. They take refuge in a ruined building, but Rand, Mat and Perrin decide to go exploring. They encounter Mordeth, the ancient, evil advisor of the King of Aridhol who helped destroy it during the Trolloc Wars. Mordeth has been given unnatural long life by his union with Mashadar, a strange, mist-like creature which prowls the ruins, killing all who enter. They escape, but unbeknown to the others, Mat steals a dagger with a ruby in the hilt, unaware it is cursed and tainted. The trio return to the rest of the group, but quickly discover that Trollocs have entered the ruins (despite their terror of Mashadar) and are closing in. The group flees, but Mashadar and Shadowspawn intercept them and force the group to splinter apart, eventually reuniting in three groups: Perrin and Egwene; Nynaeve, Moiraine and Lan; and Rand, Thom and Mat. Each of the three groups decides to proceed onwards to Caemlyn and try to reunite there. Moiraine has given each of the Two Rivers boys a warded coin, so she can determine their direction with the One Power but not their specific location. I did some preliminary work on assembling a map of Shadar Logoth, but insufficient geographic details are given to make such a map viable. The distance from Shadar Logoth to Caemlyn in a straight line is approximately 1,200 miles, or (very roughly) the distance from London to Helsinki, or New York City to Baton Rouge, which is a formidable distance to walk. On Day 12, Perrin and Egwene reunite on the far side of the Arinelle and decide to proceed across Caralain Grass, north of the Andoran border, and then cut south-eastwards towards Caemlyn. This path takes them mostly through uninhabited wilderness where they are less likely to be accosted by other travellers or Shadowspawn. Three days later (Day 15), they meet Elyas Machera, a wolfbrother, a human who has a special connection with wolves. Elyas realises that Perrin has the same ability, to Perrin’s disquiet. Three days after that (Day 18), they meet a Tinker caravan and join them for the long journey across the north of Caralain Grass. Seven days later (Day 25) Perrin, Egwene and Elyas leave the Tinkers and strike out more directly south-eastwards towards Caemlyn. Five days later (Day 30), they find an abandoned stedding and the statue of Artur Hawkwing from his capital city that was planned but never built. Here they are attacked by Whitecloaks. Elyas escapes but Perrin and Egwene are taken into custody. Ten days later, on Day 40, they are rescued by Moiraine, Lan and Nynaeve and reach Caemlyn three days later. There are problematic aspects with all three of the journeys across Andor from Shadar Logoth to Caemlyn, but arguably none more troublesome than Perrin and Egwene’s journey. Their journey is much more direct than either Team Rand or Team Moiraine, but they also lack any assistance in their journey, whilst Rand spends a chunk of the journey on boat, travelling much faster than on foot, and Moiraine’s group still have their horses. Even worse, when Perrin and Egwene meet the Tinkers their journey apparently drops to a maddening crawl, with very slow progress being made. At the same time, Perrin and Egwene have to get from Shadar Logoth to Caemlyn in 32 days, which requires them to cover an average of 37.5 miles per day even if their journey was effectively in a straight line (which generally it wasn’t), which is challenging. If they were on horseback, even if not travelling on roads, this might be more believable, but on foot and partially in a slow-moving caravan, it becomes less plausible. The only way to have this make sense is to have Perrin only think the Tinkers were making slow progress, but this being illusory due to the very monotonous scenery of Caralain Grass. In reality the caravan made excellent time across flat and dry countryside. After being captured by the Whitecloaks they were then marched (or forced to ride) in a more regimented fashion towards Caemlyn, making up the time they lost earlier on. Although not a perfect solution, it’s the only one that really makes sense. 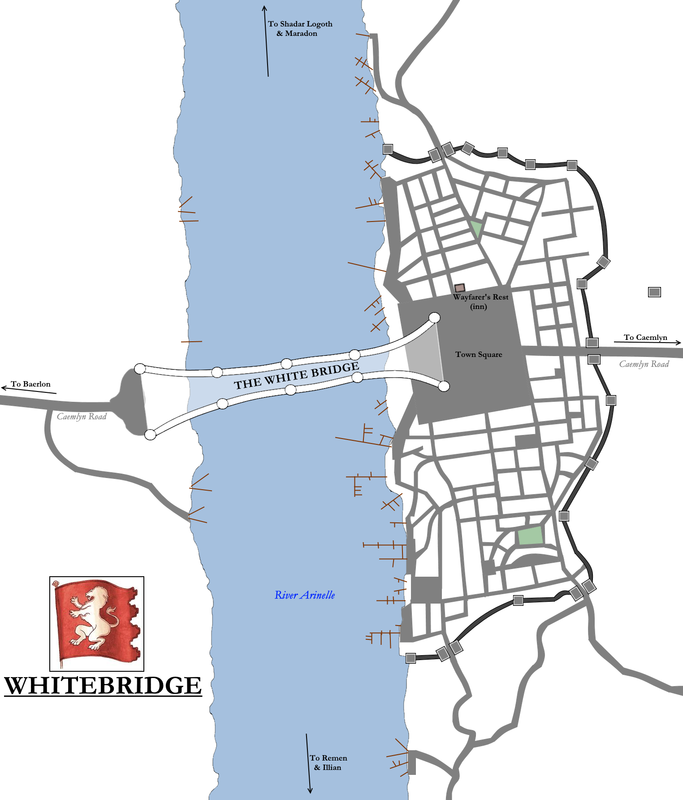 A map of the town of Whitebridge. Please click for a larger version. Mat, Thom and Rand escape from Shadar Logoth by boat, as they happen on the river vessel Spray, commanded by Bayle Domon, just outside the city. Domon refuses to wait for their friends and high-tails it out of the area ASAP. The Spray then takes twelve days to travel from Shadar Logoth to Whitebridge, which is 500 miles from Shadar Logoth in a straight line but closer to 700 given the bends in the river. This equals about 58 miles per day, which is fairly reasonable given the size of the boat and the fact it’s travelling downriver. On this journey they encounter some interesting sights, including a valley with statue-like figures carved into the bluffs the day after Shadar Logoth (so about 50 miles from Shadar Logoth). On Day 14 they pass by the Tower of Ghenjei (foreshadowing!) in the distance. Arriving at Whitebridge on Day 24, they are attacked by a Trolloc and Thom is apparently killed. Mat and Rand escape and start walking along the Caemlyn Road. From Whitebridge to Caemlyn, the distance is approximately 730 miles. Rand and Mat cover this journey in 16 days (Days 24-40), which requires them to cover 45.6 miles per day. This is challenging because at average walking speed, even for two young lads in excellent health from farm work, they would only be able to plausibly cover 30-35 miles a day. The weather apparently holds good for the whole length of their journey and they also have the benefit of a straight, flat, well-paved road for the journey, which makes things faster. The solution is that Mat and Rand probably got lifts and helping hands from carts rather more than the chapters indicate. A hardy horse drawing a relatively light cart could plausibly travel 40-50 miles in a day, so a few days in carts can draw back the time lost when they are on foot alone. It’s all a bit of a stretch, but not impossible. The major landmarks encountered on this journey are Arien (reached on Day 31), Four Kings (Day 35), Market Sheran (Day 36) and Carysford (Day 38). A few hours before reaching Carysford they are attacked by Mili Skane. They finally reach Caemlyn on Day 40, where they find the Queen’s Blessing Inn and meet Basel Gill and Loial for the first time. The town of Whitebridge is located on the River Arinelle and divides the sparsely-populated western half of Andor from the more densely-populated east. It is one of Andor’s two ports, the other one being Aringill on the Erinin. Whitebridge is a vital trade port, linking as it does Andor and its rich markets to the northern kingdom of Saldaea and the southern kingdoms of Altara, Murandy and Illian. Aside from the Wayfarer’s Rest, an inn on the main square, Jordan doesn’t give too many details about Whitebridge, except suggesting it is at least as large as Baerlon but not as densely populated. The map above is based on the excellent map created by the team at the Thirteenth Depository blog. I see no reason to disagree with their conclusions. Moiraine’s group trails Rand’s route but they have to travel by horseback along the riverbank. Despite the superior speed of river travel, Moiraine’s group reaches Whitebridge only one day behind Rand. This may be down to Moiraine’s team cutting across country (missing out the bends in the Arinelle that Spray has to navigate right around) or may be a sign that Moiraine is again using the Power to enhance the horses. This also reinforces the idea above that Rand and Mat must have gotten lifts along the way from carts, since on horseback Team Moiraine would have overhauled Rand and Mat pretty quickly. Another possibility is that three travellers on horseback, two of them recognisable as an Aes Sedai and Warder, were too identifiable so Moiraine had them travel off the road for most of the way, which would have been slower. On Day 40 (possibly the day before), Moiraine’s group turns off the Caemlyn Road and finds the Whitecloak camp, where they rescue Perrin and Egwene. They arrive in Caemlyn three days later, on Day 43 which is Adar 23rd, 998 NE, roughly corresponding to May 5th in our calendar. We’ll pick up on their adventures in Caemlyn next time. These maps cover the first part of our heroes’ journey in The Eye of the World (Book 1 of The Wheel of Time). For a detailed summary of The Eye of the World, please follow this link. The story begins on Winternight in the 998 NE, the final night of winter and the evening preceding Bel Tine, the celebration that marks the arrival of spring. This date falls on 8 Aine in the local calendar, approximating 23 March in our calendar. This is Day 0 of the Wheel of Time story and our subsequent counts will be (with varying degrees of approximation) from this date. Note that the dates are taken from Steven Cooper’s excellent Wheel of Time Chronology. The story opens on the Quarry Road just west of Emond’s Field, the largest village in the rural, bucolic backwater known as the Two Rivers. A map of the journey from Emond’s Field to Shadar Logoth. Please click for a larger version. The Two Rivers is a self-governing, semi-autonomous district of the Kingdom of Andor. It is located in the far south-western corner of Andor and is located almost 1,200 miles from the capital at Caemlyn. The Two Rivers has not seen an Andoran tax collector in generations and has no noble lord who rules over the area. The nearest large town, Baerlon, is a clear 100 miles from the northern border of the Two Rivers. The reason for this is that Andor’s population is spread quite thin west of Whitebridge on the Arinelle. It is likely that Caemlyn would have let all of western Andor go its own way generations ago if it wasn’t for the mineral wealth in the Mountains of Mist. Raw materials, resources and precious metals are quarried in the mountains, in and around mining villages like Comfrey, and then shipped down to Baerlon for further transit on to Caemlyn. Andor has focused its power in keeping open the Caemlyn Road all the way to Baerlon and making sure banditry is not a problem in the western districts. The Two Rivers, as a quiet and orderly backwater, has been allowed to go its own way. The Two Rivers measures about 130 miles from north to south and is almost 200 miles along its longest axis from west to east. The district is named for the two rivers which border it: the River Tarendrelle, locally known just as the Taren, to the north and the Manetherendrelle (known locally as the White River) to the south. A third river, the Winespring Water, is located at the heart of the district, flowing eastwards from Emond’s Field into the swamps of the Mire. The Two Rivers is reasonably large overall, but the amount of populated and inhabitable space is considerably smaller. The Sand Hills, the foothills of the Mountains of Mist, are located to the west and are sparse and arid, with few good sources of water. To the east, the Winespring Water, Taren and White River come together in a confusing morass of marshes known as the Mire, with the Waterwood to the north-east. The land here is swampy and not very fertile. As a result, the populated regions are limited to the main north-south highway (known as the Old Road south of Emond’s Field and the North Road to the north), the Westwood and the open countryside between the Westwood, the Mire, the Waterwood and the rivers. There are only four settlements of note in the Two Rivers. From north to the south these are Taren Ferry, on the northern border; Watch Hill; Emond’s Field; and Deven Ride. Emond’s Field is the largest village in the district but is still quite small. All four settlements seem to have populations in the hundreds at best. Working out the population of the Two Rivers overall is challenging due to a lack of firm data. However, based on the numbers that the Two Rivers later deploys in battle, it appears that the total population of the district runs from 10,000 at the extreme lower end to 50,000 at the upper end. If the latter seems implausible, it’s worth remembering the scale of the map: the Two Rivers is called “small” and “a backwater” but it’s actually about a quarter the size of England. It should also be recalled that the population of the Two Rivers increases dramatically between The Eye of the World and the sixth book in the series, Lord of Chaos (but we shall cover that later). Mapping the Two Rivers should be straightforward, as Robert Jordan drew a map of the district for inclusion in The Eye of the World. This map was later redrawn by Ellisa Mitchell for the YA two-volume edition of The Eye of the World and then again, this time in full colour, for The Prophecies of the Dragon (the expansion to The Wheel of Time Roleplaying Game). However, Jordan was (at least initially) very reluctant to include maps at all in the books and this map gives every indication of being drawn about five minutes on the back of an envelope to appease the publishers. There are significant differences in orientation between this map and the general map of the Westlands, particularly the more detailed colour map Ellisa Mitchell created for the hardcover endpapers. My map combines the original Jordan map with the general map of the Westlands, resulting in a slight rotation of the Two Rivers from a N-S to a slightly more SW-NE direction, and making the rivers match the general map rather than their somewhat more artificial course on the local map. 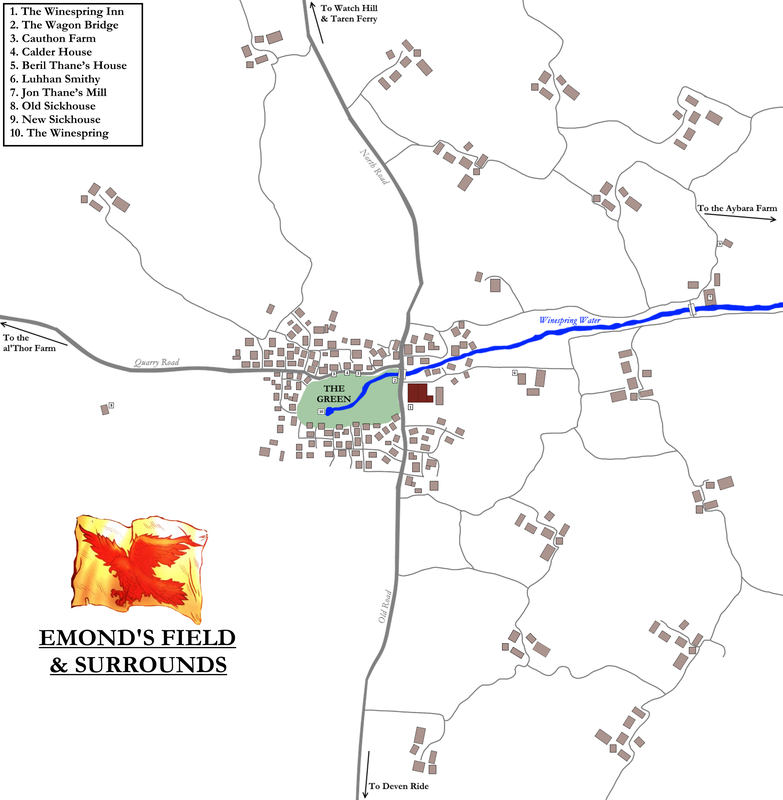 A map of Emond’s Field and the surrounding area. Please click for a larger version. The map of Emond’s Field is based on the excellent and definitive map from the Thirteenth Depository blog. Surprisingly, Robert Jordan never drew his own map of the village, despite its importance in the Wheel of Time narrative. Instead, the map draws on Jordan’s descriptions of the village from The Eye of the World, The Shadow Rising and several other books. Emond’s Field is centred on the Green, a large open space in the centre of the village. Major buildings are clustered around the Green, the largest of which is the Winespring Inn with its distinctive red roof, the village’s largest inn and the home of the mayor, Brandelwyn al’Vere, and his family. Emond’s Field consists of the businesses and houses you’d expect in a village, but it’s also an amalgamation of farms clustered along the banks of the Winespring Water. The village has grown up around a crossroads of sorts, with the main north/south road through the Two Rivers passes through the village (it’s known as the North Road north of the village and the Old Road to the south) and the Quarry Road leads from the Green westwards towards the Sand Hills, through the Westwood. There is no major road leading east, but there are well-travelled tracks leading to homesteads and farms, such as the Aybara farm which is located north of the Winespring Water, well to the east of the village. Emond’s Field is built on the site of Aemon’s Field, the site of the last great battle between the army of Manetheren and the invading Shadowspawn hordes during the Trolloc Wars. It was here that King Aemon made the ultimate sacrifice, laying down his life and that of thousands of his men to buy the civilians of the city of Manetheren enough time to escape southwards. Upon his death, Queen Eldrene channelled more of the One Power than it was safe to handle, killing herself and incinerating Manetheren but also obliterating the Shadowspawn army almost to the last creature. The village of Aemon’s Field later sprung up on the site of the battle, the name becoming corrupted over the passage of over 2,100 years. The Thirteenth Depository makes strong arguments for their placements of major buildings, including the Winespring Inn at the eastern end of the Green and the cluster of houses along the northern edge of the Green, including the Cauthon farm. The al’Thor farm is located several hours travel by horse and cart to the west of Emond’s Field, so probably 10-15 miles away. The Aybara farm may be located a similar or greater distance to the east, along the Winespring Water. I did place the Luhhan Smithy, which is not shown on the original map. My reasoning for its location east of the Winespring Inn is that the smithy would be located close to the river and further back from the village so as not to disturb the residents (in real medieval towns the smithy might be more centrally located, but with very little through-traffic through Emond’s Field this is less of a concern here). During the Trolloc raid on Emond’s Field on Winternight, the Luhhan smithy and Cauthon farm take the brunt of the attack and several adjacent buildings are badly damaged, but the village otherwise survives the attack in good order. After the Trolloc raid on Emond’s Field, the Aes Sedai Moiraine and her Warder Lan convince Rand al’Thor, Perrin Aybara and Mat Cauthon that the Dark One is searching for them and they should leave to protect their homes and families, drawing the enemy after them. The gleeman Thom Merrilin attaches himself to their party, as does the Mayor’s daughter Egwene al’Vere. Seven travellers thus set out from Emond’s Field in the evening of 9 Aine 998 (Day 1 of the series). The party travels at impressive speed on horseback, making it all the way from Emond’s Field to Taren Ferry in a single night (less than 10 hours or so). This appears to be a distance of between 50 and 60 miles. This would be impressive for a well-provisioned party travelling for a full day, let alone in a single night. However, this is explained by Moiraine using the One Power to enhance the stamina of the horses. This helps explain an otherwise puzzling discrepancy in the text: the fact it then takes the party an additional six days to travel from Taren Ferry to Baerlon, a distance of just 100 miles. This is just 16 miles a day, a somewhat poor pace for people on foot, let alone horses. However, the slow pace can be explained by the horses needing time to recover from their One Power-enhanced flight and by the party travelling off-road where possible, avoiding farms and houses. The travelling time may also have been reduced by Lan’s weapons practice sessions with the boys and Moiraine’s One Power training sessions with Egwene. A map of Baerlon. Please click for a larger version. Baerlon is the largest settlement in all of Andor west of Whitebridge. Rand and his friends are over-awed by the settlement on first viewing, describing it as a huge city (to Thom Merrilin’s amusement). In truth, Baerlon is a reasonably large town at best. It has 20-foot-tall wooden walls and guard towers, and two gates. The Caemlyn Road passes right through the town, leading to Whitebridge (some 620 miles to the south-east) and the mining villages in the Mountains of Mist to the west. Given that there only appear to be two gates, the road presumably splits just west of the town, with one road running north and west to the mountains and another south to the Two Rivers. Baerlon is apparently bigger than Emond’s Field, Watch Hill and Deven Ride combined (and possibly Taren Ferry as well), although this is not necessarily saying much. The town is large and prosperous enough for all of the buildings to have chimneys and slate roofs, although clearly not rich enough to stretch to stone walls. There are farmsteads all around the town, presumably supplying it with food. The town has at least nine inns and taverns, including the Stag and Lion, where the party takes residence. The party spend only one night and one day in Baerlon, although it is eventful: they are intercepted at the inn by Nynaeve al’Meara, the Emond’s Field village Wisdom. Rand meets Min Farshaw for the first time, and she has her first “viewing” of his destiny. Rand also meets Padan Fain, a peddler who frequently visits Emond’s Field, only to find that he is acting very strangely indeed. After Rand almost inadvertently picks a fight with three Children of the Light, he is confronted by a Myrddraal. The presence of the Myrddraal spooks Moiraine and she decides that the party should leave Baerlon as soon as possible. After a brief altercation with the Children of the Light at the east gate (variously named as both the Caemlyn Gate and the Whitebridge Gate), which Moiraine ends with a powerful illusion, the party heads east along the Caemlyn Road. No previous map of Baerlon exists, so I had to create this one from scratch. The only reference available was the illustration of Baerlon from the graphic novel version of The Eye of the World, which is lacking fine detail, but nevertheless suggests a somewhat circular town athwart the Caemlyn Road. It appears at this point that Moiraine’s plan is to simply follow the Caemlyn Road all the way to at least Whitebridge and possibly Caemlyn, before heading north to Tar Valon. However, this plan rapidly becomes untenable: substantial Trolloc forces have been brought into the area and start threatening to surround the party. Making it the 620 miles to Whitebridge (let alone the 1,250-1,300 miles by road to Caemlyn from Baerlon) clearly becomes impossible. With reluctance, Moiraine shifts course and the party heads north, crossing the rough countryside of the Hills of Absher, before making it to the ancient, foreboding city of Shadar Logoth on the banks of the Arinelle. This part of the journey has always been problematic to map. As the crow flies, it is about 110 miles from Baerlon to Shadar Logoth, but the party is not travelling in a straight line. Instead, they travel south-east along the Caemlyn Road for three days before they are intercepted by Shadowspawn and forced to flee north towards Shadar Logoth. With the best will in the world, it is not possible to reduce the distance from where our heroes leave the Caemlyn Road to Shadar Logoth to less than 80 miles, but they seem to cover this distance in a single day; it is still light when they reach Shadar Logoth. Assuming they made an early start on Day 11 and the detected the Trollocs quite early on, this still only gives them between 9 and 10 hours or so to make it that distance. They are helped by being on horseback, but the terrain is rough (even through Lan reports that the southern hills are far rougher than the northern). One assumption that can perhaps be made is that, although it is not stated in the text, Moiraine uses the One Power to enhance the horses once again so they can make about 8-9 mph, even on the hilly terrain. This makes the ability to cross the distance more plausible (although it’s still a bit of a stretch). The party reaches the outskirts of Shadar Logoth in the late afternoon of the 11th day after leaving Emond’s Field, 19 Aine 998 NE, roughly approximate to 3 April in our calendar. We shall pick up their adventures there next time. 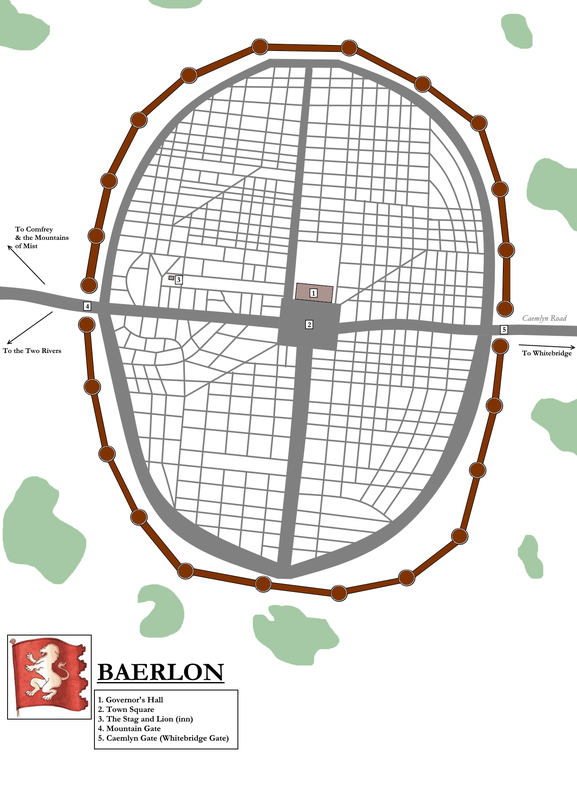 Tar Valon is the largest, most populous and richest city in the Westlands, as well as one of the oldest and certainly the oldest to have survived (mostly) intact since its founding. 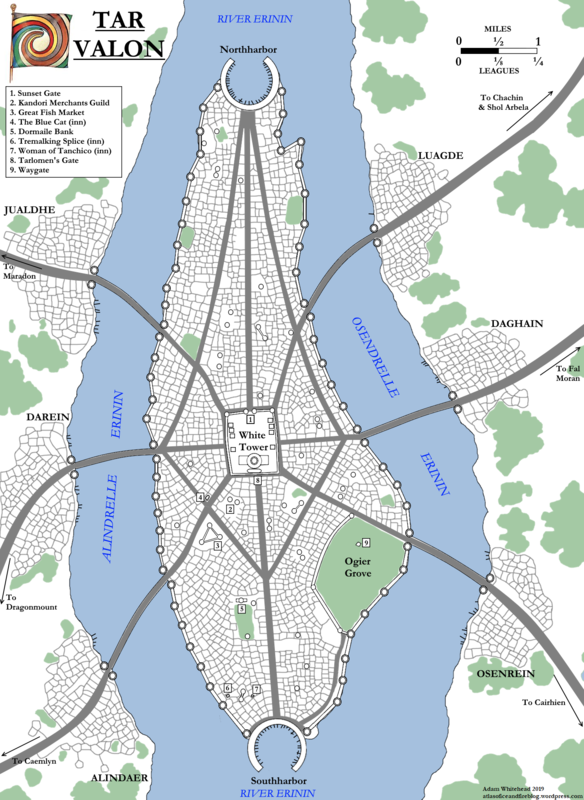 An independent city-state located halfway between the Borderlands and the rich kingdoms of Andor and Cairhien, it is famed as the home and primary headquarters for the Aes Sedai, the wielders of the One Power. 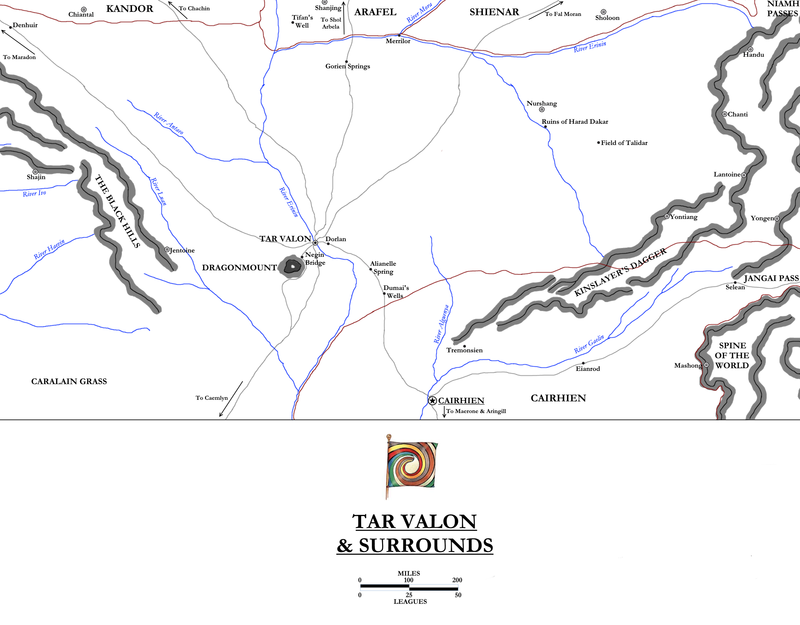 The city-state of Tar Valon in 998 NE. Please click for a larger version. In the Age of Legends, the Aes Sedai – “Servants of All” in the Old Tongue – were channellers of the One Power, both male and female. They were loosely organised in a guild, commanded by the Hall of the Servants. The Hall – both the body and the building in which it operated – was located in Paaran Disen, the largest and most beautiful city in the world. At the end of the War of the Shadow, the Dark One’s curse tainted saidin, the male half of the True Source, driving all male channellers insane on the instant. In their insanity they destroyed civilisation and almost wiped out humanity in a series of tumultuous earthquakes, tidal waves and volcanic eruptions known as the Breaking of the World. The Breaking lasted for some three centuries and was ended only when the last male Aes Sedai was killed or gentled (cut off from the Power). In the aftermath of the Breaking, numerous organisations of women able to channel had formed. These had been begun by female Aes Sedai survivors of the Age of Legends, who had found and trained girls. The process had been complicated by the loss of the art of Travelling (able to travel thousands of miles in an instant with the Power), possibly due to the constantly shifting ground making it impossible to “learn” a location in the world and work out how to Travel to another. The groups trained others and so on. By the end of the Breaking it appears that few or no Aes Sedai from before the chaos survived. How many groups of female channellers emerged from the chaos of the Breaking is unknown. What is known is that these groups soon began jostling for power and influence with one another, sometimes violently. It may well be that the Westlands may have gone the way of Seanchan, a shifting quilt of kingdoms ruled by Aes Sedai warlords, had not reason prevailed. In 47 AB a grand convocation was held of female channellers. Approximately sixteen factions were represented, possibly more, and the names of twelve representatives are recorded: Elisane Tishar, Mistora Caal, Karella Fanway, Azille Narof, Saraline Amerano, Dumera Alman, Salindi Casolan, Catlynde Artein, Biranca Hasad, Mailaine Harvole, Nemaira Eldros and Lideine Rajan. It appears that each woman represented a separate group or organisation claiming to be Aes Sedai. During this conference it appears there was an agreement to ally these factions into one “true” Aes Sedai organisation. Each one of the separate factions was to become an ajah, a political alliance within the larger organisation. Ajah were a creation of the Aes Sedai in the Age of Legends, temporary groups which came together on certain issues. It appears they were prevented from becoming permanent factions due to the divisiveness, factionalism and tribalism this encouraged (believed by some to have resulted in significant chaos in the period before the Age of Legends began). Groups such as the Hundred Companions and the Fateful Concord were ajah of the War of the Shadow, for example. Once the agreement was made to ally the Aes Sedai together, it was also decided they would need a base of operations. The wide island on the River Erinin within sight of Dragonmount, the burial mound of Lews Therin Telamon and reportedly the place where he would be reborn, was a natural choice. However, the amalgamation of the Aes Sedai was not smooth. It appears that, at a certain point, Lideine Rajan and Mailaine Harvole rebelled against the way things were being handled and tried to break away from the nascent organisation. At the end of the resulting conflict, circa 77 AB, Lideine was stilled and Mailaine forced to surrender. In 98 AB construction of both the city of Tar Valon and the White Tower began. Ogier stonemasons were contracted and the One Power was employed in both endeavours. By this year the organisation of the Aes Sedai had become established, with Elisane Tishar listed as the first Amyrlin Seat (a title descended from the First Among Equals of the Age of Legends Aes Sedai, who wore the ring of Tamyrlin). The Hall of the Tower had been established to advise her, consisting of seven advisors: Caal, Fanway, Narof, Amerano, Almoan, Casolan and a newcomer, Kiam Lopiang. This suggests that the earlier twelve ajah had by now amalgamated into seven, with Lopiang perhaps representing Mailaine Harvole’s now-reconciled faction. During this period the Aes Sedai carried out a purge of other groups claiming the title. This purge was thorough and widespread. During this period the Aes Sedai also established firm influence through the nascent city-states and nations, with several Aes Sedai rising to command these polities as governors and sometimes Queens. By the time Tar Valon was completed in 202 AB, the current formal organisation of the White Tower had come into being. The Aes Sedai were split into seven permanent Ajah, each represented by a colour: Blue, Brown, Green, Grey, Red, Yellow and White. Each Ajah is represented in the Hall of the Tower by three Sitters, for twenty-one Sitters in total. The Amyrlin Seat is the head of the Tower, the first among equals, with the Keeper of the Chronicles serving as her aide-de-camp. This organisation remains in place today, despite the numbers of Aes Sedai falling. 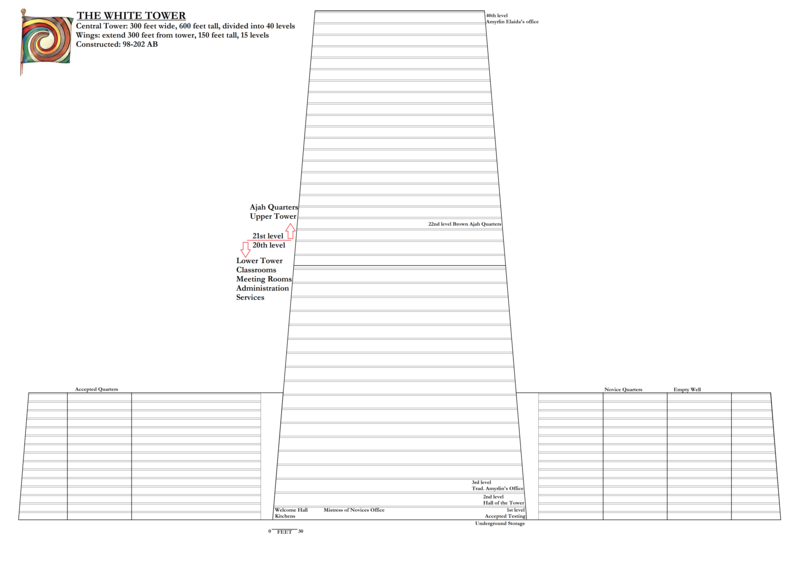 The White Tower was designed to hold 3,000 women, with room for future expansion, meaning the original number of Aes Sedai was likely between 2,000 and 2,500. That number was approximately 1,250 during the Aiel War, some 3,254 years after Tar Valon’s completion. The reduction in numbers is slow, but steady. Some Aes Sedai believe this is down to the Aes Sedai practice of gentling or killing male channellers “winnowing” the ability to channel out of the human race, whilst others point to the lack of proactive Aes Sedai recruitment: since far more women can learn to channel than have the inborn spark, the majority of these will go undetected unless found by an Aes Sedai. The potential number of Aes Sedai sisters, given the population of the Westlands, is likely in the tens of thousands at least, but the White Tower prefers a smaller, more flexible organisation. In 209 AB Mabriam en Shareed of Aramaelle, both Queen and Aes Sedai, called a meeting at Tar Valon between the rulers of the ten nations that had arisen. At this meeting was signed the Compact of the Ten Nations, binding them to peaceful coexistence and mutual trade and alliance in face of the Shadowspawn threat. The Aes Sedai likely played a key role in mediating this treaty. The treaty held for eight centuries, through the rise of the false Dragon Raolin Darksbane in 335 AB (whose followers mounted the first assault on Tar Valon when he was captured, which was repulsed) until the Westlands were invaded by Shadowspawn hordes in 1000 AB, marking the beginning of the Trolloc Wars. The Aes Sedai proved key in defeating the Shadow during the wars, particularly the leadership and impressive military acumen displayed by Rashima Kerenmosa, the Soldier Amyrlin. Rashima’s bold leadership saw the Fourth Siege of Tar Valon (1290 AB), which saw Shadowspawn storming the city, end in a stunning victory, followed by her planning for the Battle of Maighande (1301 AB), the largest battle fought since the War of the Shadow. The surviving armies of the Ten Nations crushed the Shadow, slaughtering so many Myrddraal and Dreadlords that the Trollocs went out of control and lost all battle discipline. This reduced the rest of the war to a prolonged mopping-up exercise. Rashima gave her life and that of her five Warders in the battle, personally slaying nine Dreadlords in direct combat. During the Free Year period, Aes Sedai influenced remained key but somewhat dwindled. After Queen Sulmara of Masenashar (c. FY 450) no Aes Sedai are reported as ruling nations and respect for the organisation, although still present, was less all-encompassing. A particular blow to the organisation was the Black Fever, which swept across the continent in FY 937-939 and killed millions of people. Although the Aes Sedai helped where they could, the number of sick people was too high and the number of Aes Sedai (particularly Yellow sisters, who specialised in Healing) too low. This was followed by the opportunistic rise of Guaire Amalasan, a false Dragon. Seizing control of the Kingdom of Darmovan in FY 939, he embarked on a campaign of conquest which, by the spring FY 943, had delivered a third of the continent into his hands. He was defeated by Artur Hawkwing at the Battle of Jolvaine Pass in FY 943, who then delivered him to Tar Valon to be gentled. Hawkwing then had to help defend Tar Valon from a counter-attack by Amalasan’s followers in a fierce battle that reached the White Tower itself. Hawkwing was credited with saving Tar Valon, to the unmitigated fury of the Amyrlin Seat, Bonwhin Meraighdin, who could not countenance the idea of a man saving the White Tower. Bonwhin spent almost fifty years trying to destroy Hawkwing, including manipulating other nations into attacking him and – as certainly Hawkwing believed – arranging the deaths of his wife and children. The latter incident (although doubted by historians and Aes Sedai) inspired Hawkwing to break all ties with Tar Valon and besiege the city in starting in FY 975. In FY 992 Deane Aryman, a Sitter for the Blue Ajah, exposed evidence confirming that Bonwhin had tried to manipulate and control Hawkwing against the Hall of the Tower’s command. Bonwhin was deposed and stilled only two years before Hawkwing’s own death from advanced age. On Hawkwing’s death, his general Souran Maravaile lifted the siege of Tar Valon and marched to aid Ishara Casalain in securing the Lion Throne of the newly-declared sovereign kingdom of Andor. Within days, Aes Sedai sisters were riding to every corner of the Westlands, hoping to forestall that chaos they sensed was coming. They failed. The War of the Hundred Years was a particular low point for the Aes Sedai, who were unable to bring their influence to bear to mediate an end to the conflict. The war petered out by itself. A combination of the Aes Sedai’s failure and the rise of the Children of the Light, a military ascetic group who believed that the Aes Sedai were Darkfriends for their use of the Creator’s blessed power, saw Aes Sedai influence and respect tumble (along with their numbers) in the subsequent thousand years. In 978 NE Tar Valon became the hinge on which the fate of the Westlands turned…or so it was popularly said. Two and a half years earlier, four clans of the Aiel had swarmed out of the Waste and sacked Cairhien. King Laman had retreated south into Haddon Mirk and fought a lengthy guerrilla war before finally winning support from Tear and Andor. His armed crossed the Erinin and fled north, pursued by the Aiel. It was realised that if the Aiel could be delayed enough, the Aes Sedai could negotiate a Grand Alliance between all the Westlands nations to meet the Aiel in battle at Tar Valon itself, which could be fortified and turned into a trap for the Aiel armies. After some tense negotiations (particularly with Amadicia and the Children of the Light), the Aes Sedai succeeded. More than 170,000 troops in official contingents from ten kingdoms, along with mercenaries and irregular forces (such as a band of Malkieri veterans led by Lan Mandragoran and an small force from Arad Doman under Rodel Ituralde), arrived to meet the Aiel force of approximately 70,000. The resulting battle was declared a victory, as the Aiel force withdrew and returned to the Waste. However, in reality the Aiel simply withdrew the second they had achieved their objective – killing King Laman for the crime of cutting down the tree Avendoraldera, a gift from the Aiel to the Cairhienin given five centuries earlier – and no longer had any need to press the attack. This engagement – the Battle of the Shining Walls, sometimes called the Blood Snow – remains the largest battle fought since the War of the Hundred Years. The Aes Sedai hoped it would usher in a new age of cooperation between the nations, but alas this did not come to pass. Tar Valon is located on an island in the middle of the River Erinin, approximately 400 miles north-west of Cairhien and almost 1,600 miles upriver from the city of Tear. The Erinin splits in half around the island city, with the western branch of the river called the Alindrelle Erinin and the eastern branch the Osendrelle Erinin. The city sits on a relatively flat river plain, with the only major feature breaking the horizon being the mountain known as Dragonmount. Located more than thirty miles south-west of the city, Dragonmount is huge. The height of the mountain has not been firmly charted past twenty thousand feet, but it is known that it is very difficult to breathe high on the mountain. The peak is almost unreachable due to a massive rent in the side of the mountain, which spews lava and smoke into the sky on a regular basis. Dragonmount is believed to be the tallest mountain in the world, taller even than any peak in the Spine of the World and much more dramatic for the way it rises from the plains alone. There aren’t any other mountains or even significant highlands until the Black Hills some 250 miles west of Dragonmount. The city of Tar Valon fills the entire island of the same name, which is eight miles long and three miles wide at its widest point. The entire island is surrounded by thick, impressive walls, approximately 50 feet tall and punctuated by sixty-four guard towers, each around 100 feet high. The walls are smooth, but there are river gates at the base of the towers which allow small ships to dock; these alleviate passenger pressure on the bridges. The river gates can be sealed very easily in times of war, so as not to make a weak point in the defences. The walls, guard towers and many of the buildings within Tar Valon are made of a beautiful white stone, the result of Ogier workmanship. Tar Valon has a long-standing contract with Stedding Jentoine (located 300 miles to the west, in the Black Hills) for the upkeep and maintenance of the city. The site of the walls from afar is breathtaking, and led to them being dubbed the Shining Walls. Six long, arching bridges link the city to the mainland; even the shortest of these bridges is still over a mile long. At the foot of each bridge is a town or village which has sprung up to support trade: clockwise from the north-east, these are Luagde, Daghain, Osenrein, Alindaer, Darein and Jualdhe. Some speculate that in time these towns may grow into cities of their own, suburbs of a greater Tar Valon metropolitan area. Each bridge (and each gate it leads to) are named for the town in question, and each bridge is heavily fortified by gatehouses at both ends. The towns themselves have been sacked, occupied and burned several times in war. At the northern and southern tips of the islands are two great harbours, named Northharbor and Southharbor. The Shining Walls extend in massive white circular arcs around each harbour, with a gap for entry and exit. Larger ships, up to Sea Folk rakers, can dock in these ports. There are also additional docks along the inland banks of the river for larger cargo vessels, or if the main harbours are full. Each harbour possesses a massive chain and winch-houses (elegantly hidden in the walls) to seal the harbour off in times of siege. From the harbours, massive boulevards (capable of handling at least six wagons abreast) lead to the very centre of the city. Larger boulevards also radiate out from the centre to each of the bridges. These boulevards are the city’s main thoroughfares, sometimes lined with trees but mostly lined with impressive buildings. The city is dotted with beautiful structures constructed by the Ogier over 3,000 years ago, including a building in the shape of a cat and another as a shoal of fish. Many of these buildings are filled with businesses reflecting the nature of the building; the cat building is now the home of the Blue Cat Inn, for example, and the shoal of fish building is the home of the Great Fish Market. At the very centre of the city is the White Tower. The tallest building constructed in the Westlands since the Breaking (although the Stone of Tear contains a greater volume), the White Tower is 600 feet tall and over 300 feet wide at its base, tapering to 200 feet wide at the top. The central tower is divided into 40 levels above ground (with an unknown number of basements and subbasements), with the lower twenty containing classrooms, lecture halls, meeting rooms, administration, services and the Hall of the Tower. The upper twenty contain the living quarters for the seven Ajahs. Two wings extend out some 300 feet on either side of the central tower, one containing living quarters for the Accepted and the other for the novices. The White Tower was built to house some 3,000 Aes Sedai (on the assumption that many more would be out working in the world), but with only 400-500 sisters present at any one time and only forty novices currently enrolled in the Tower (as of early 998 NE), the building can feel strangely empty. Behind the White Tower is a palatial building which houses the Tower Library, the greatest accumulation of knowledge in the known world (only challenged by the Great Library of Cairhien, although even this is generally considered to be inferior). Other buildings dot the Tower grounds, including the quarters and practice yards for the Warders and several surprisingly elaborate stables, which are multi-level affairs with impressive facilities for the upkeep and care of the Tower’s huge number of horses (since each sister and Warder require a riding horse each, alongside pack animals). The Tower grounds are surrounded by their own walls and gates, although the gates are usually left open (albeit guarded at all times). The Sunrise Gate and Tarlomen’s Gate are two of the gates through the walls. Dotted throughout the city are more towers of varying height, although even the tallest do not challenge the White Tower. These towers are sometimes solitary but occasionally are linked to nearby towers via skybridges. These towers are serve a variety of functions, some being homes but others being places of trade or commerce. Commerce is the lifeblood of Tar Valon; with no nation to support the city, it instead relies heavily on its status as an independent city-state with reasonable taxes and a commanding position on transcontinental trade routes. Merchants’ guild halls dot the city (including an elaborate branch of the Kandori Guild), as do banks. House Dormaile of Cairhien has made an impressive profit from the Tar Valon establishment, which is so trusted that it does extensive business with the Aes Sedai themselves. This is also why the city is packed with inns, fine eateries and other places where business can be conducted. Tar Valon is an extremely safe city, with the streets well-lit and frequently patrolled by the Tower Guard. The areas near the docks but away from the boulevards, where the buildings crowd more closely together and there are back-alleys and narrow lanes, are the closest Tar Valon gets to rough quarters, but even these are very safe compared to similar districts in, say, Tanchico or Tear (and nothing in Tar Valon or the surrounding towns comes close to the Rahad of Ebou Dar). Tar Valon is notable for the amount of greenery within its walls, considering that space is at a premium. There are several small parks and several noble families and rich businesses maintain small estates even within the city walls. Most notable, however, is the Ogier Grove. Located in the south-east of the city and over two miles wide, the Grove also acts as a park and meeting place. It is surrounded by white walls, but these are penetrated by frequent arches, allowing people in and out of the grove at their leisure rather than having to search for a specific gate. Near the heart of the Grove is a Waygate, which, according to rumour, can allow people to travel from the Grove in Tar Valon to those in other cities (although some have been destroyed, buried or built over) via the Ways. The Ways have become dangerous to travel, so the Waygate has been sealed off by thick gates and is guarded at all times. The White Tower in the heart of Tar Valon. Please click for a larger version. Tar Valon is administered by a city council which is under the authority of the Aes Sedai. Several sisters sit at the head of this council and are appointed by the Hall of the Tower. They in turn report to the Hall, the Keeper of the Chronicles and the Amyrlin Seat. The council is generally efficient enough that governance of the city is left to its hands without troubling the Aes Sedai’s upper hierarchy. The council also holds representatives from the guilds, banks, nobles, Tower Guard and businesses. Tar Valon is defended by the Tower Guard, a highly-trained elite force whose modest name belies their capabilities. The Guard are a multi-disciplinary force consisting of crossbowmen, footsoldiers and cavalry. As well as defending the Tower itself, they police the city and patrol the outlying hinterlands of the city-state. During the Aiel War, other 12,000 soldiers served in the Tower Guard, although it is unclear if this is its peacetime strength as well. The population of Tar Valon is in constant flux, with thousands of merchants, travellers and visitors leaving the city on any given day and thousands more arriving. However, the average population of Tar Valon and the bridge towns on any given day is estimated at 500,000. This makes Tar Valon comfortably the most populous city in the Westlands, close on twice the population of the next-largest city (reportedly Caemlyn). Tar Valon as depicted in the New Spring comic adaptation, art by Mike S. Miller. Tar Valon is the richest individual city in the Westlands and its economy may be stronger than that of some entire countries. 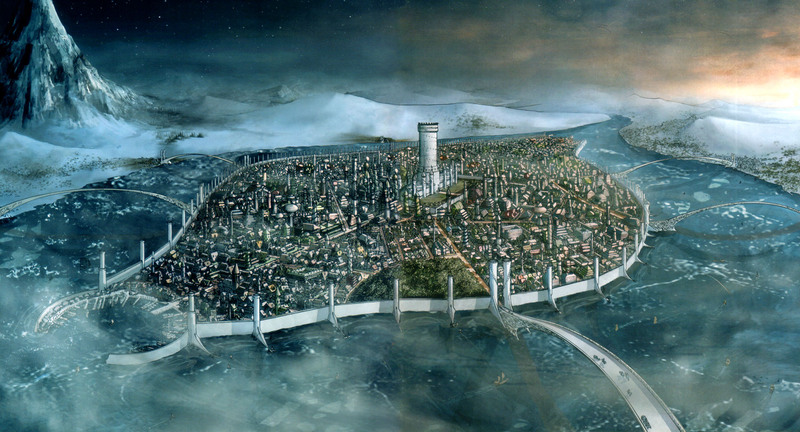 The city’s lifeblood is trade, which comes from its control of the River Erinin. Trade from Tear, Andor and Cairhien flows northwards along the river and goods from Arafel and Shienar come south along the river, with substantial goods also coming overland from as far as Saldaea (whose capital, Maradon, is almost 1,200 miles from Tar Valon). Even the Sea Folk trade at Tar Valon, despite its discomforting distance (almost 1,700 miles) from the sea. Tar Valon’s trade economy is bolstered by the presence of numerous banks, guilds and trading houses within the city, attracted by the city’s position athwart several key trade routes linking north and south, east and west, as well as its reputation for honesty, security and safety. Tar Valon is also the home of the Aes Sedai. Although the Aes Sedai do not, as a rule, sell their use of the One Power to the highest bidder, they do entertain offers and requests from individuals and nations to lend their aid in particular endeavours of mutual interest. The low number of Aes Sedai and the growing distrust of them among more distant nations means that this it is a rare event, but occasionally the Aes Sedai will grant their services. Finally, Tar Valon is a neutral and respected power (if not as respected as it once was), and its location makes an idea location for meetings between major governments. Andor, Cairhien and the Borderlands are all relatively nearby and enjoy good relations with Tar Valon, and use it (and, sometimes, Grey sisters) to mediate trade deals or peace treaties. Tar Valon is a melting pot of peoples, cultures and representatives from every nation in the Westlands and beyond, to the Sea Folk islands. The streets at the height of the trading season can be a riot of colours, styles and different types of people. Still, the city tends to follow the Aes Sedai preference for more modest clothing and restrained behaviour, with licentiousness generally frowned upon. Shienar is located in the far north-east of the Westlands, and famed as the most martial of the modern kingdoms. It is located on the very front line against the Shadow; whilst all of the Borderlands hold the line against the Blight, Shienar has to guard Tarwin’s Gap, the preferred invasion route for Shadowspawn armies into the Westlands since the Breaking of the World. Shienar has inherited this responsibility from Malkier, a great nation now fallen into ruin. 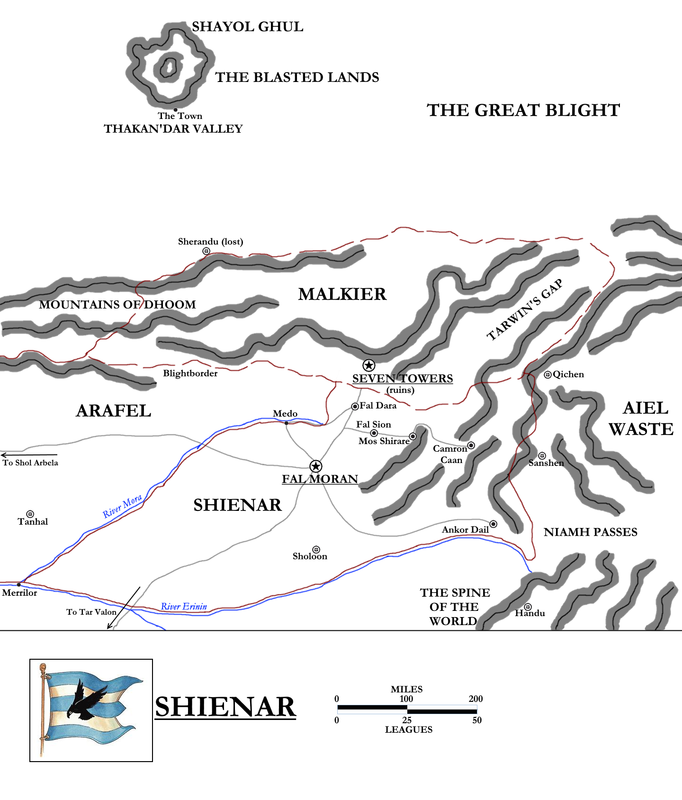 A map of Shienar. Please click for a larger version. The history of Shienar is very similar to that of Saldaea and the other Borderland kingdoms. In terms of recent history, Shienar has spent most of the time since the War of the Hundred Years acting in a rearguard position to Malkier to the north and Arafel to the east, sending troops to help both when needed. Over the course of the centuries, Shienar was fortified with the idea of becoming a fallback position should Malkier fall. Alas, in 955 NE this came to pass. Of the other Malkieri survivors, most died in battle but one went on to gain much fame across the world. Jain Charin, later called Jain Farstrider, became a legendary traveller. He explored all the nations of our land and also travelled extensively amongst the Sea Folk and the Aiel, even venturing as far afield as Shara. His legendary travelogue Travels is possibly the biggest-selling book written since the Breaking. Jain, more than sixty years old yet still hale, disappeared in the 990s NE whilst on one of his adventures and is presumed dead. Shienar became the new Borderland on the front line, its great fortress-city of Fal Dara committed to defending Tarwin’s Gap. Lord Agelmar Jagad, believed by many to be the greatest living military mind, has been given command of the fortress with orders to throw back the Shadow should it seek to come south again. Shienar extends from its south-western corner – an obscure and unimportant region known as the Field of Merrilor – to the north-eastern frontier in the Spine of the World for almost 700 miles, but on average is only a bit more than 200 miles wide. The borders are considered to be the River Mora to the west, the River Erinin to the south, the Spine of the World to the east and the Blight to the north. Western Shienar, watered by two significant rivers and their tributaries, consists of wide open plains and fields, which provide the kingdom with its food. The east and north of the country is far more rugged and mountainous. The Spine of the World dominates the eastern part of the country, with the Niamh Passes linking Shienar to the northern Aiel Waste. This pass is sometimes used by the Aiel to raid into Shienar, resulting in Shienar building a fortress known as Ankor Dail to guard the frontier. Although the Shienarans respect the Aiel’s skill in battle, they consider the raids to be a dangerous distraction from the threat of the Shadow in the north. In the central-northern part of the country lies Fal Moran, the capital city. A heavily-fortified settlement, it is the seat of the royal family and is the centre of the nation’s economy and culture. To the north lies the Blightborder. Just fifty years ago, this border ran much further north on the far side of Malkier, but the collapse of that nation has brought the Blight to Shienar’s front door. Shienar maintains a series of fortresses along this frontier, designed for mutual defence and support. The largest and most notable of these is Fal Dara, built on the ruins on the ancient Ogier-built city of Mafal Dadaranelle. Fal Dara is the mustering point for the northern armies and the closest stronghold to Tarwin’s Gap. The fortresses of Fal Sion, Camron Caan and Mos Shirare lie on the frontier as well, but further away. North and east of Fal Dara lies Tarwin’s Gap, the great pass that separates the Mountains of Dhoom from the Spine of the World. More than 350 miles long, the pass leads from the Shienaran frontier directly into the Great Blight itself, giving Shadowspawn armies an easy route of access into the Westlands. Directly north of Fal Dara lies the fallen kingdom of Malkier. Malkier was located north of Shienar and Arafel, on both sides of the jagged Mountains of Dhoom. The mountainous kingdom was built around defence, with numerous fortresses and outposts guarding multiple passes leading north into the Great Blight. Measuring 700 miles from east to west and around 200 miles across, it matched Shienar in size but exceeded it in defensive capability. Its capital was also called Malkier, although it was much more commonly called the Seven Towers, for the seven great towers rising above its walls, towering above the surrounding lakes. More than a thousand lakes (according to legend) ringed the nation, providing additional defensive options against an attacking enemy. The Seven Towers were located in the south of the country, fairly close to Fal Dara across the border. After the fall of Malkier, the Blight overran its territory. Many of the lakes dried up, the crops died and the sickening malaise of the Blight infested everything. The Blightborder moved some 200 miles south from its former location to the northern frontier of Shienar. 250 miles north-west of the Malkieri frontier, across a wide swathe of the Great Blight, lies the forbidding mountain of Shayol Ghul. Ringed by the Blasted Lands, a land of scorched earth where nothing can grow, Shayol Ghul is a towering volcanic mountain, rivalling or exceeding storied Dragonmount in size. According to myth, Shayol Ghul is the location of the Dark One’s prison, although this is not quite accurate; the Dark One’s prison is located outside of the Pattern altogether. Shayol Ghul or, more accurately, the Pit of Doom at its heart is the location where the Pattern has thinned enough so it is possible to directly communicate with the Dark One, should one be so insanely inclined. Like its neighbours, Shienar is a hereditary monarchy advised by noble houses. The respected King Easar Togita is the current ruler of Shienar. Much authority falls on the commander of his armies, currently Agelmar Jagad, Lord of Fal Dara and Defender of Tarwin’s Gap. Lord Agelmar is an acknowledged military genius, a master tactician who has orchestrated major victories against invading Shadowspawn armies with superior numbers on dozens of occasions. Shienar enjoys an extremely close alliance with Arafel to the west and with Tar Valon as well. Like its neighbours, Shienar is a nation on a permanent war footing. The entire kingdom is arranged around a defence in depth and also in preventing the Shadow from striking behind the lines: every street and alley of every town and city is lit at night to prevent Myrddraal from gaining access. Every settlement, no matter how small, is defended by stout walls. Every man, woman and child is taught how to fight, forage and, if necessary, flee. This makes assessing its population and military strength difficult, especially as the line between civilian and soldier in Shienar is more blurred than in any other nation (even the other Borderlands). However, it is known that the four Borderland nations combined can muster about 400,000 troops, suggesting that their combined population is around 40 million. Shienar sent 29,000 troops to the Battle of the Shining Walls, more than any other nation, and still had more than enough to defend the Blightborder, suggesting that Shienar’s total military potential is greater than any other Borderland nation bar the considerably larger Saldaea. Shienar specialises in the art of heavy cavalry, of using massed, heavily-armoured cavalry formations to break open Trolloc ranks and inflict colossal damage with heavy lances. Shienaran military tactics combine overwhelming strength with surprising elegance and tactical flexibility. Shienar is a heavily militarised nation, but it does engage in trade along the Erinin with Tar Valon, Cairhien, Andor and distant Tear, some 2,500 miles to the south. It also trades with the other Borderland nations. Its militarised nature means that it produces enormous quantities of armour, weapons and missile projectiles, most of which it keeps for itself but it does assist the other Borderlands with supplying their forces where necessary. The Shienarans are, understandably, a somewhat grim-faced people who maintain a state of constant vigilance against the Shadow, even moreso than the other three Borderlands. The Shienarans know that it was relaxing their guard and engaging in political games which doomed Malkier, and they will not suffer the same fate. That said, the Shienarans are not a completely humourless people. The lesson of Aridhol from the Trolloc Wars, which tried to defeat the Shadow by becoming more ruthless still, has also been learned. Shienarans know how to celebrate life and have time for songs, laughter, family and friends…as long as they do not weaken their watch on the Blight. Shienaran dress is relatively modest. The closest thing to a national dress or custom is that Shienaran men often shave their faces and sometimes their head, apart from a topknot. Kandor and Arafel are the central Borderlands, located to the east of mighty Saldaea in the west and populous Shienar in the east. They are two of the lesser-known nations of the land, with relatively little interest or influence in southern nations, but are still important nations charged with the defence of the Blightborder. A map of Kandor and Arafel. Some locations are speculative. Please click for a larger version. Kandor and Arafel’s histories are very similar to that of Saldaea. In terms of their recent history, Kandor and Arafel allied in 953 NE to send an army to relief of Malkier. They are unable to arrive in time to save the nation but, allied to the Shienarans, they inflicted a devastating defeat on the Shadowspawn forces which had sacked the Seven Towers at the Battle of the Stair of Jehaan. The Shadowspawn were broken and routed, but Malkier had been effectively destroyed, and attempts to hold back the Blight failed. 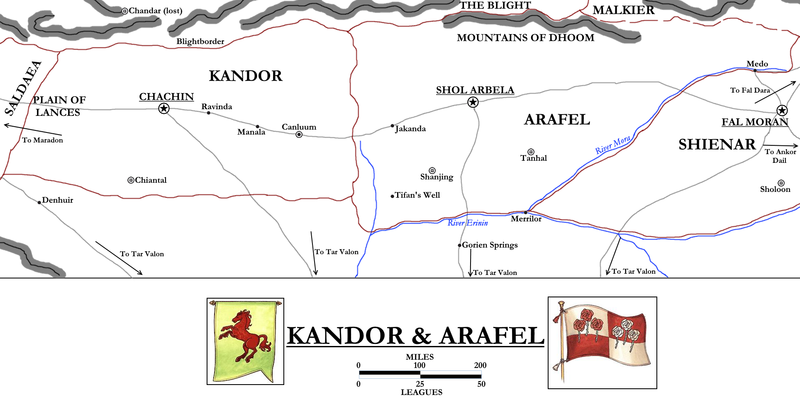 Kandor and Arafel also both mustered large armies to march to the relief of Tar Valon during the Aiel War, but the army of Kandor was recalled to deal with a fresh Trolloc incursion in the north. Arafel’s army, however, successfully took part in the Battle of the Shining Walls, with 21,000 troops (the fifth-largest contingent) commanded by Lord Hirare Nachiman (presumed to be the brother of King Paitar). Lord Nachiman was killed during the battle. In 979 NE Kandor was visited by tragedy when Prince-Consort Brys, the husband of Queen Ethenielle, and their son Diryk both died, apparently falling from the Aesdaishar Palace to their deaths. Foul play was suspected, but never proven. Kandor is approximately 500 miles wide from east to west and between 250 and 300 miles across from north to south. Murandy and Mayene (if counted as a nation rather than a city-state) are the only kingdoms which are definitively smaller than Kandor. Kandor counts its borders as the Blight to the north, the Plain of Lances to the west, a tributary of the Erinin to the east and a more flexible border in the south, where settlements give way in the face of the open, empty countryside north of the Black Hills. Kandor is mostly flat with temperate countryside located in the south and more mountainous terrain in the north. Kandor’s capital city is Chachin. Although not usually counted as one of the great cities of the Westlands, Chachin is said to rival Tear in size. It is located around several hills with three great mountains rising out from the centre of the city. The Aesdaishar Palace, the location of the Throne of Clouds, is located on the peak of the tallest mountain, some 5,000 feet above the rooftops of the rest of the city. The city is surrounded by an immense drymoat which completely encircles it, with twenty-four bridges crossing it to gates. Each bridge is overlooked by guardtowers and formidable defences. Other towns and villages in Kandor include Canluum, Ravinda and Manala. Arafel measures almost 700 miles across at its widest point and 300 miles from north to south, although the border with Shienar cuts a large swathe of territory out of the south-eastern part of the kingdom. Arafel’s borders are the River Mora to the east, the River Erinin to the south, a tributary of the Erinin to the west and the Blightborder to the north. Arafel’s capital is Shol Arbela, the City of Ten Thousand Bells. It is the fashion in Arafel for people to wear bells in their clothes and the city is reportedly home to many other bells as well. Shol Arbela is not counted as one of the great cities of the Westlands and may be one of the newest capitals, as it was built after the Trolloc Wars (as it is neither Ogier-built nor built on the ruins of an Ogier-built city). It is notable as one of the largest non-Ogier-built cities constructed since the end of the Breaking. Other settlements in Arafel include Tifan’s Well and Jakanda. Both Kandor and Arafel are hereditary monarchies, like Saldaea, with the monarch supported by the noble families of the realm. The current ruler of Kandor is Queen Ethenielle Cosaru Noramaga and the current ruler of Arafel is King Paitar Nachiman. Both Kandor and Arafel are nations mobilised for war, with a string of heavily-defended fortresses and watchtowers along their northern borders. Both nations have strong military forces, with Arafel specialising in the use of swords in battle. Some Arafellin schools of swordmastery train in style that uses two swords simultaneously. This style is less practical against human opponents, but against slower Trollocs allows for a considerable amount of damage to be inflicted in a short space of time. In terms of population, it is known that the four Borderland nations combined can muster about 400,000 troops, suggesting that their combined population is around 40 million. Kandor, as the smallest of the four kingdoms, almost certainly musters the smallest force but this is unclear. It is known that Arafel was able to spare 21,000 troops to send to the Shining Walls without weakening their defence of the Blightborder, whilst Kandor’s army had to return to meet a renewed raiding threat, suggesting that Arafel is the militarily stronger of the two nations. Kandor thrives on trade, particularly trade extending along the Blightborder from Maradon in the west to Fal Moran in the east, and thence south to Tar Valon. Kandor has a powerful merchants’ guild which ensures the smooth flowing of trade via Chachin’s trading houses. Arafel’s economy is less defined, although it does seem to have a native bell-making trade and is also located on key trade routes between the other Borderlands and Tar Valon. The River Erinin flows along Arafel’s southern border, giving it easier trade access to the rich markets of the south. Kandor and Arafel, like Saldaea, are made up of straight-talking, military-minded people, but Kandori merchants buck this trend somewhat by being shrewd negotiators. Kandori are otherwise straightforward and modest. The Arafellin are a slightly more flamboyant people, noted for the bells they wear in their hair and clothes which jingle merrily (apart from in the military, where they are removed to ensure their position is not given away). The Arafellin are also noted for their obsession with honour, taking umbrage if their honour is impugned and admitting fault and even requesting punishment if warranted. Outsiders find Arafel’s obsession with honour to be unusual.